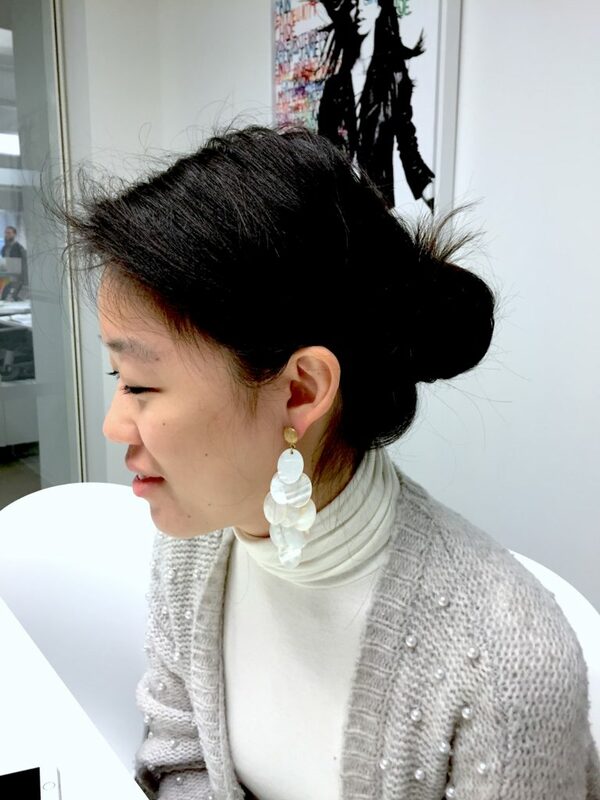 One of our favorite parts of designing a collection is getting to see the final product on a beautiful model, being worn just how we imagined. 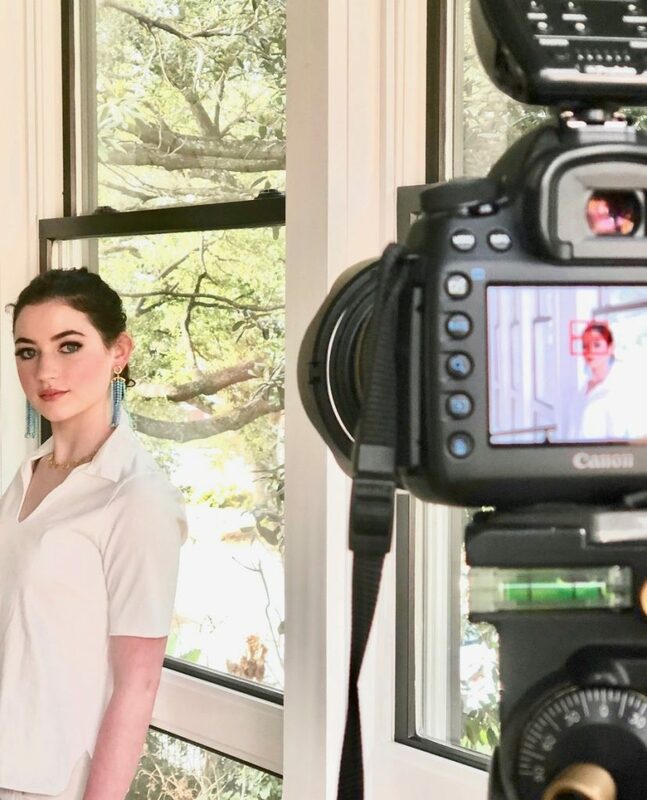 Follow along for an exclusive Behind The Scenes of this Spring’s photo shoot! 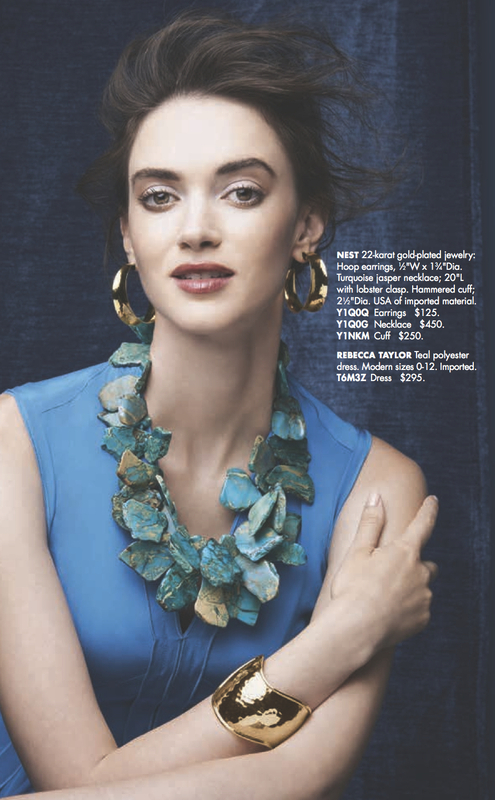 This season’s collection features natural Chrysotine, Amazonite, Larimar, Blue Lace Agate, Turquoise, Jade, and Opal stones as well as Freshwater Pearls and hand carved Mother-of-Pearl – always luxuriously handcrafted in our Dallas, Texas studio. 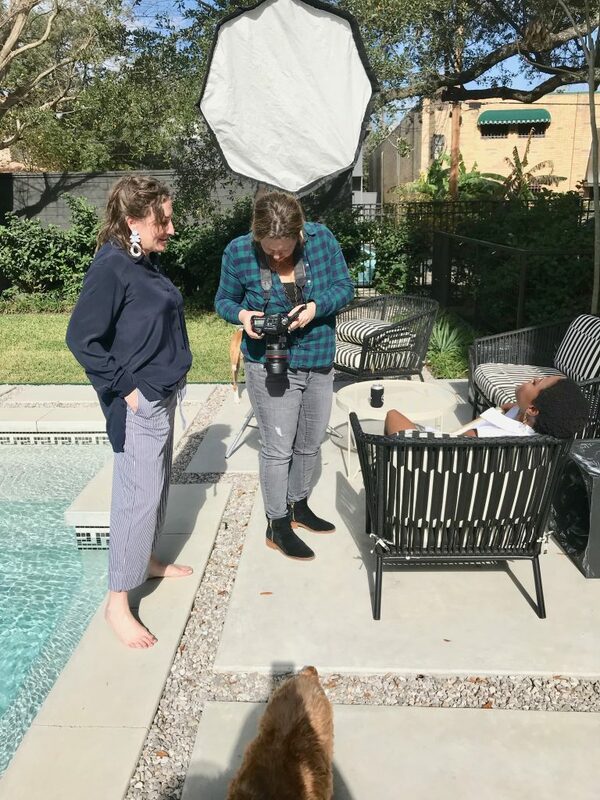 We chose to shoot our campaign at none other than Julie Soefer’s studio – she’s our go-to for all of our photography needs. 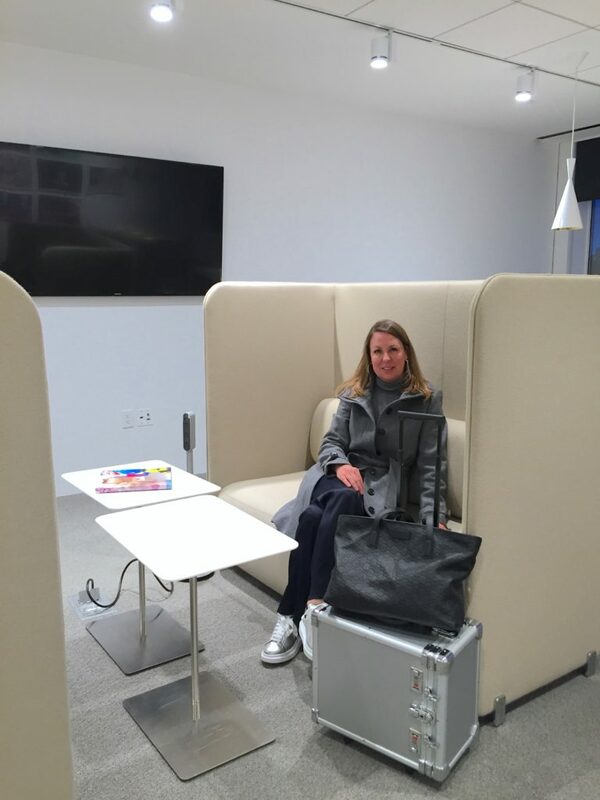 Her new studio was designed by NEST Design Group and it was rewarding to get to personally see how well the space functioned! Our models for the day started getting picture perfect bright and early! Did we mention two of the three models are part of the family? Kayla (the blonde) and Maddie (the brunette) were great additions to our photoshoot. This truly is a family affair! After hair and makeup (thank you Victoria Callaway! ), we started putting together looks. With the help of our stylist, Marzi, we put together the perfect blank canvas for our pieces that transition from daytime to poolside. Shooting jewelry is truly an art. 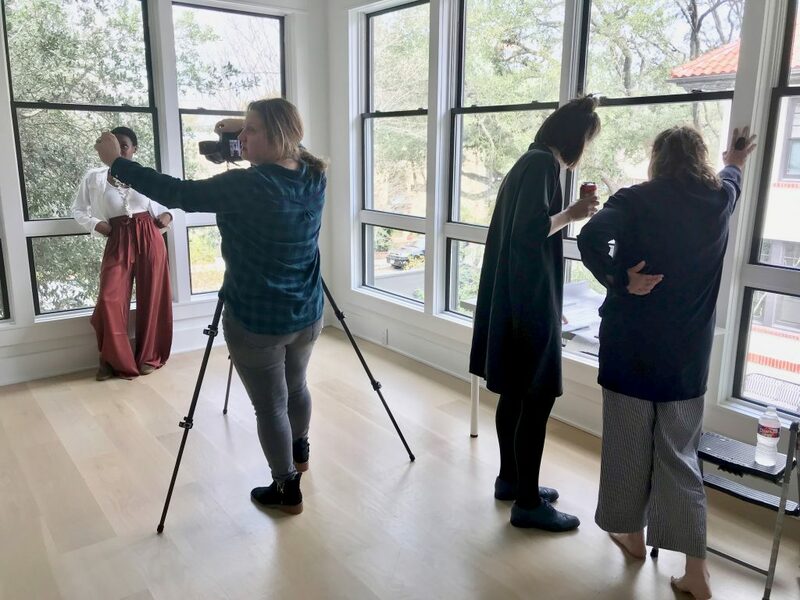 Janette and Jana were standing by with their keen eyes to adjust every detail – we at NEST pride ourselves on perfection! After a long day of work, we were thrilled to kick our feet up and have a drink or two. 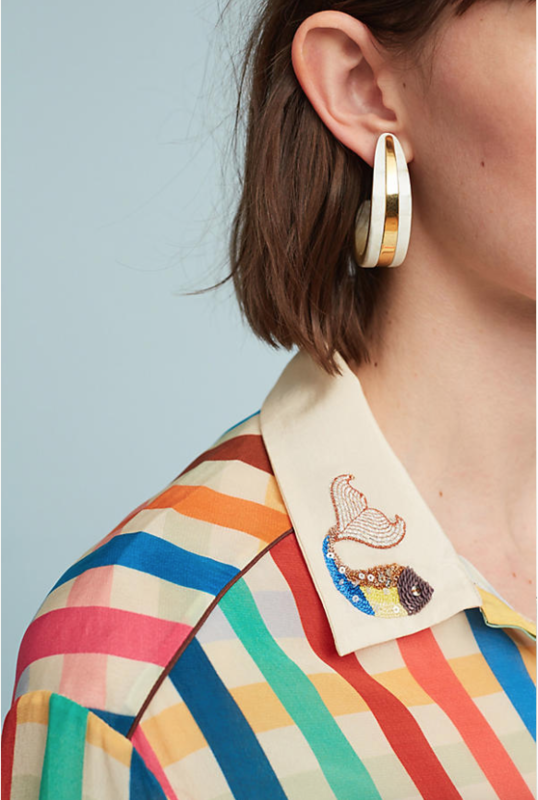 To check out our full Spring ’19 Lookbook, visit nestjewelry.com. And use code SPRING to shop our styles with free shipping! Festive parties and get-togethers officially kick off with Thanksgiving dinner. This holiday may be focused on food and family, but don’t forget fashion from the Thanksgiving menu! 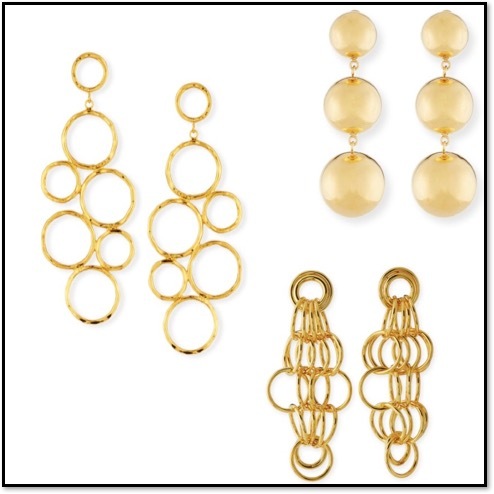 Keep it simple with these no-fuss jewelry options layered over an all black ensemble. 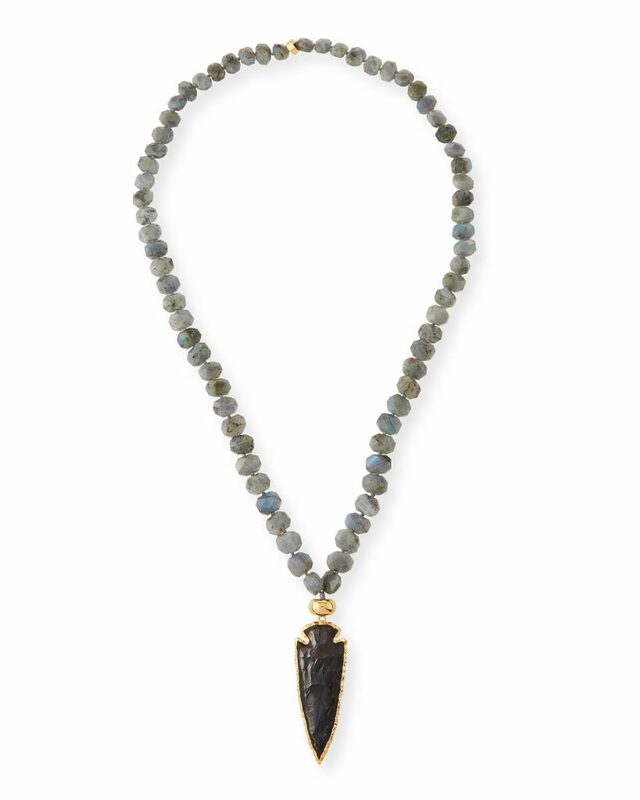 Our multi-strand tourmaline necklace is a gorgeous shade of merlot with a little metallic pop – not to mention it’s the perfect length for sit-down events. 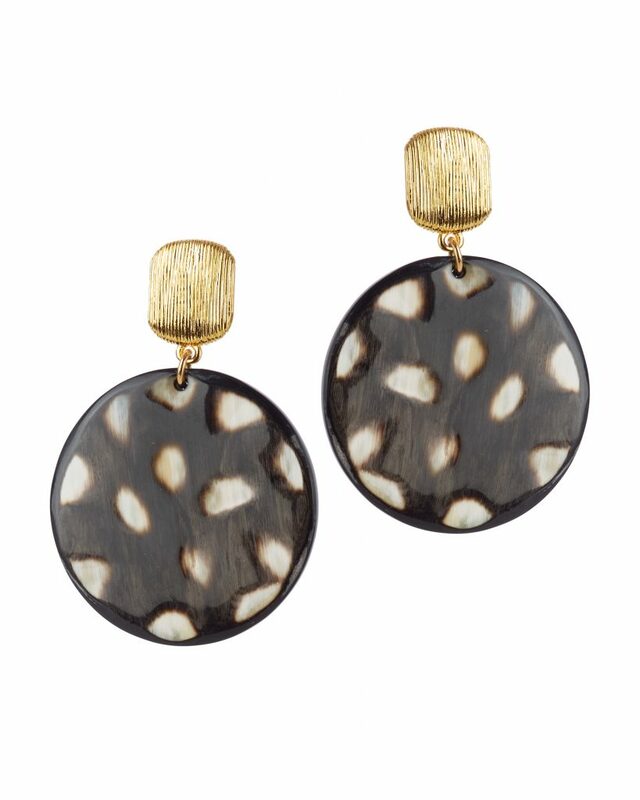 Pair with a hammered gold cuff and our black druzy clip-ons for the complete autumnal look. There’s always one “wild card” party you get invited to and have not a clue what to wear. 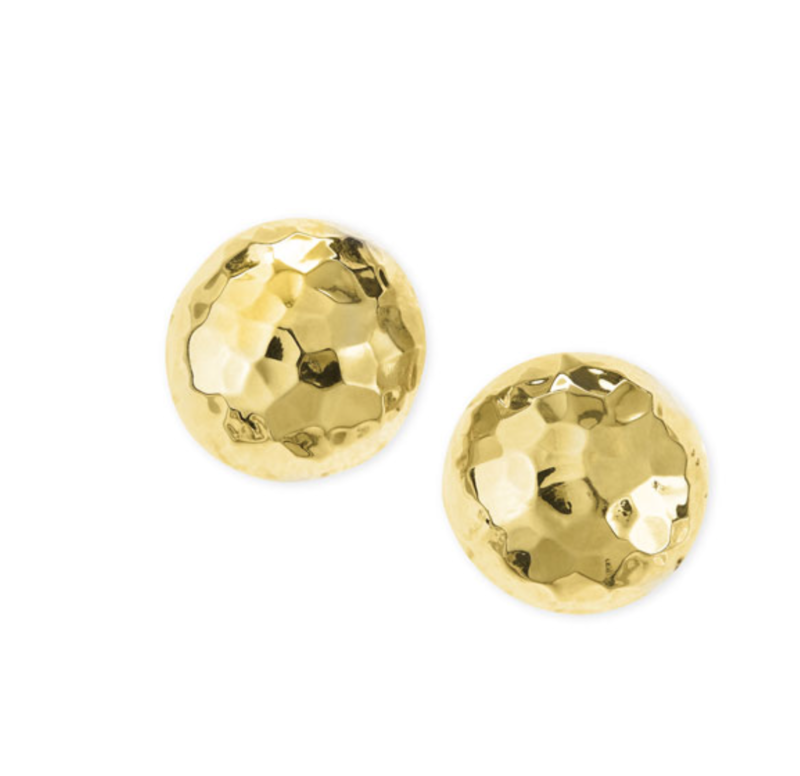 For the growing in popularity “ugly Christmas sweater party,” we suggest going to your not-so-basic gold statement earrings. While your sweater screams “festive” your accessories will be whimsical yet wearable. We know you’ve been eyeing them – this is your excuse to add them to your collection! 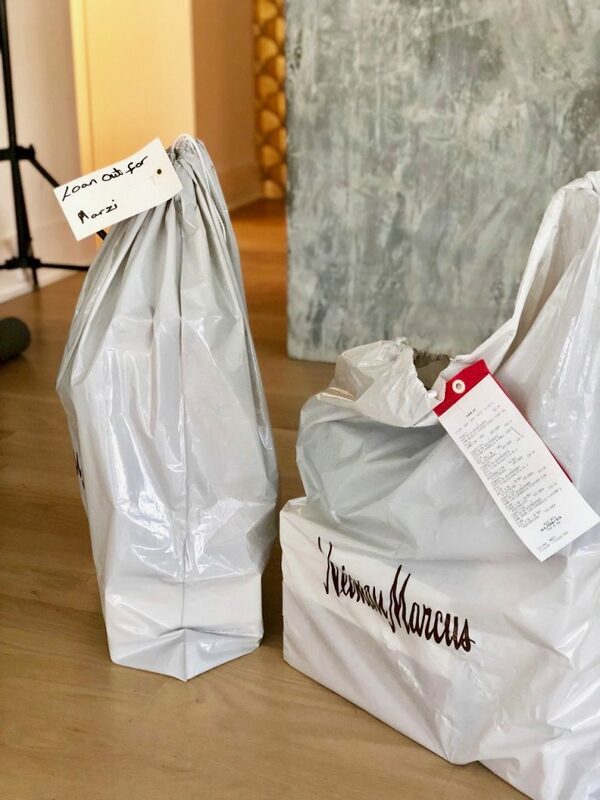 Charity events are in full swing around the holidays, and you may feel overwhelmed picking outfits for every event without repeating. Our tip? Let your accessories – not the dress – do the talking. 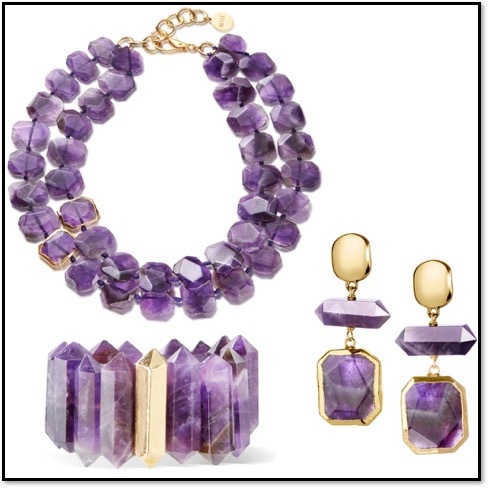 Pull out your tried and true black gown, and pair with this show-stopping amethyst set. 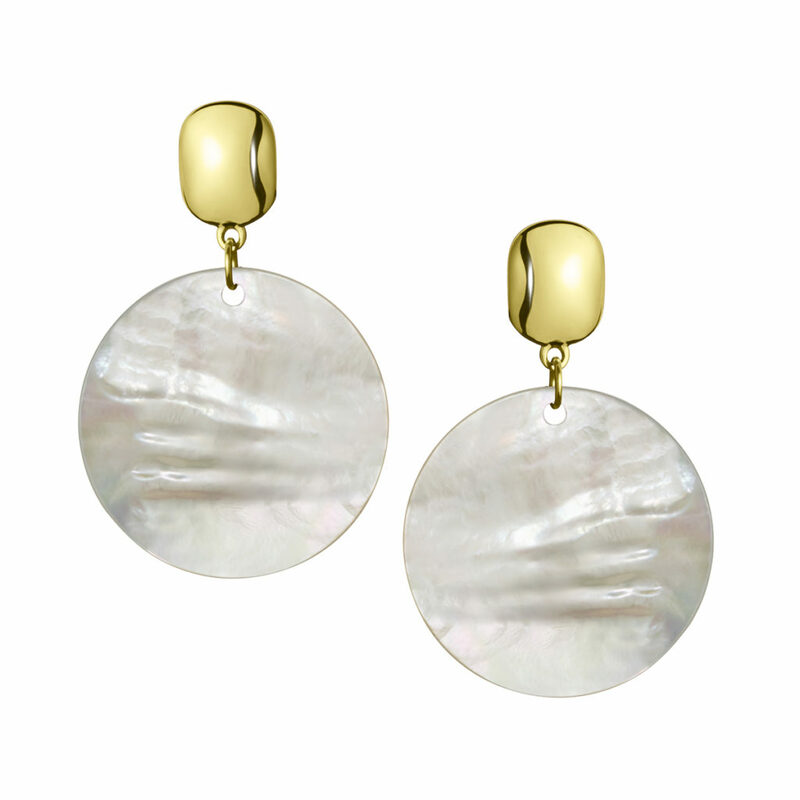 All eyes will be on your rich-hued jewels, and you will definitely make a statement. We adore this deep purple set with the gold-trimmed details, and we know you will too. The holiday season is in full swing and so are your cocktail parties scattered throughout your calendar. 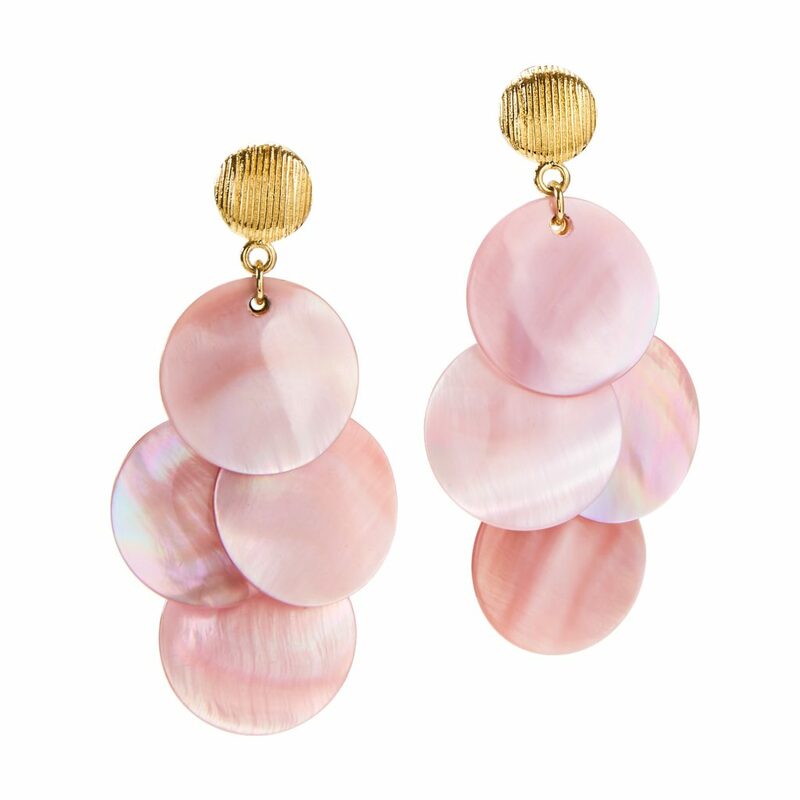 Don’t worry about what you’re going to wear – stick to your favorite neutral pieces in your closet and add new statement earrings to change it up. 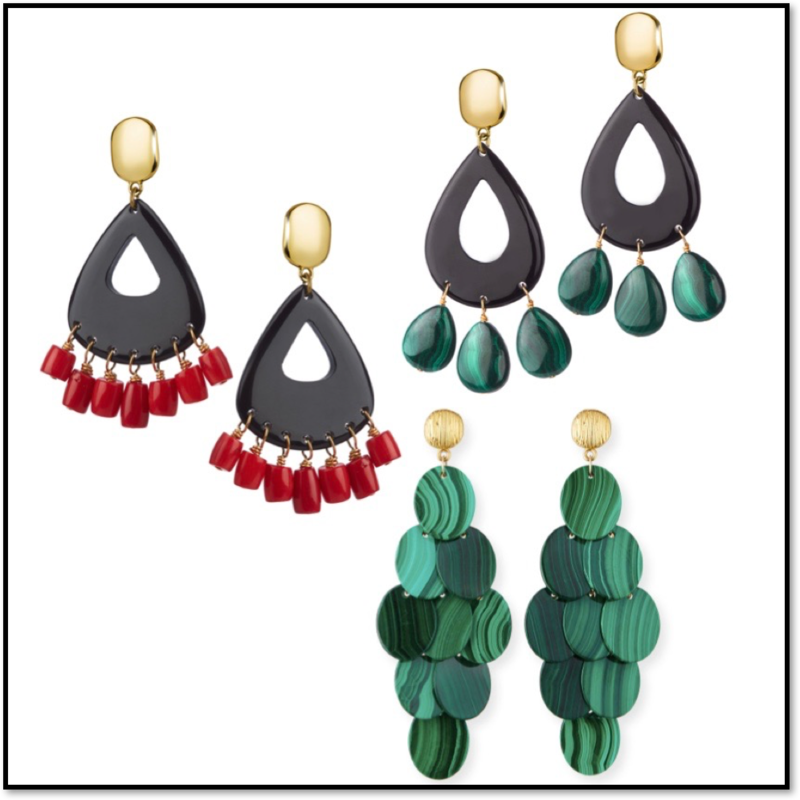 While red is the classic choice, we also love the deep green malachite stones – green is an unexpected choice for the holidays but such a fashion-forward pick. 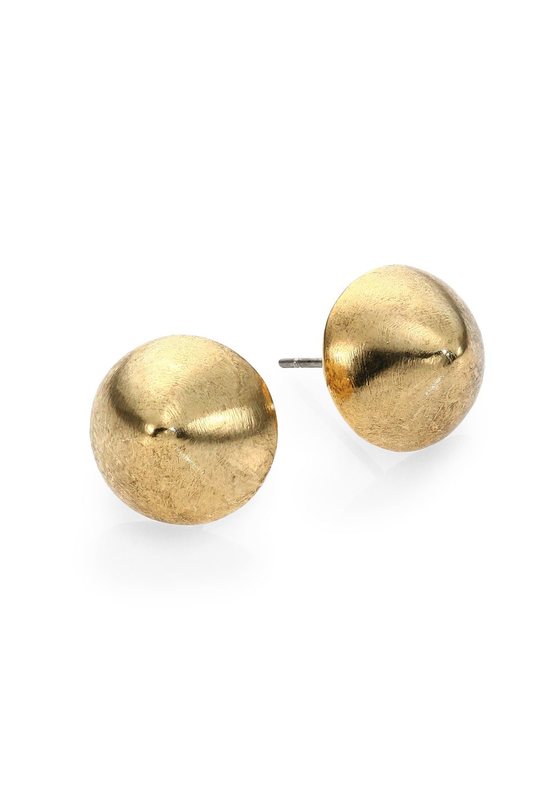 Pair with a red lip to complete your look! Whether you’re attending a church service or spending quality time with family on Christmas Eve, we think the easiest accessory to throw on is a long pendant necklace. 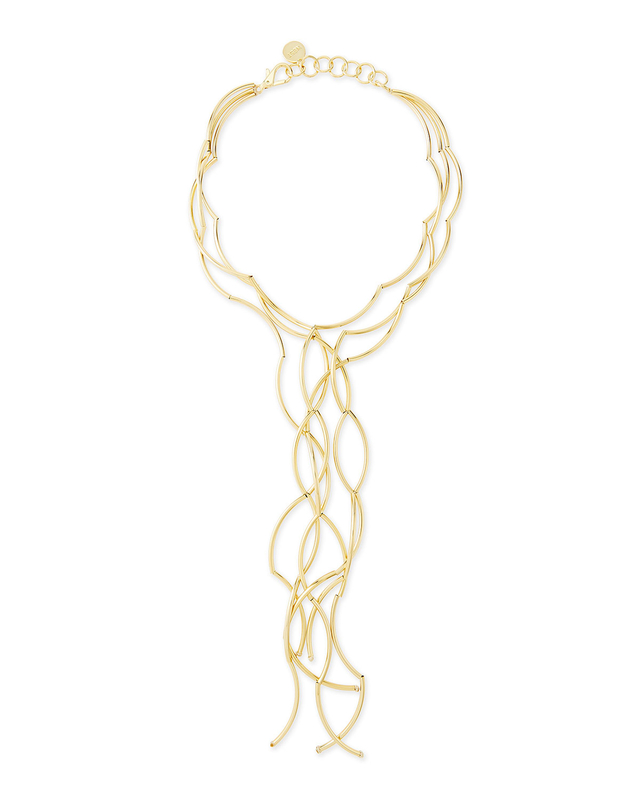 We love this winter white bone tassel piece with hints of gold – it’s the best way to keep your look classy but fashion forward. 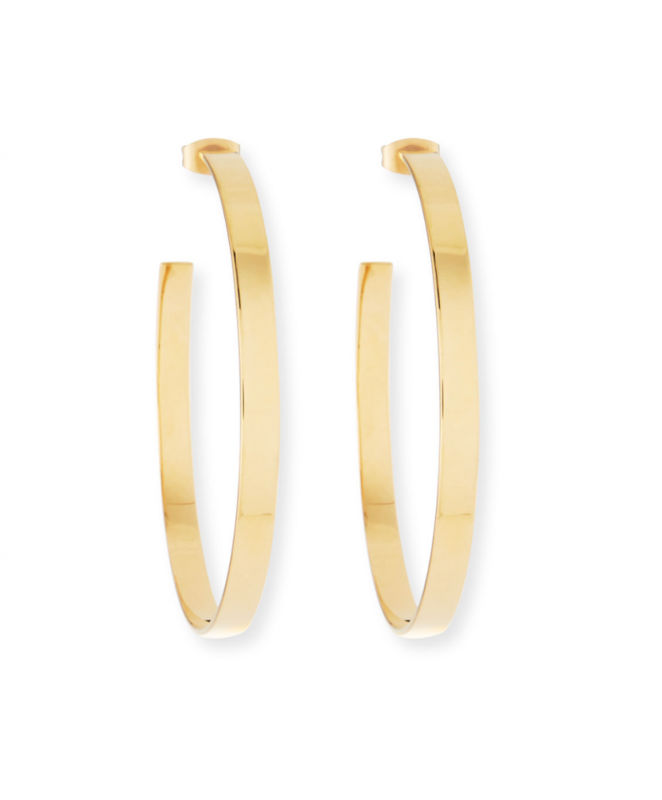 Complete your look with classic gold hoops (the perfect size!) 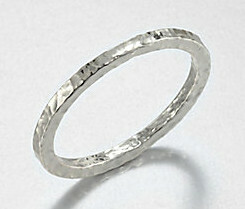 and a simple but bold ring. New Years Eve – the last party of the year with the most va va voom! 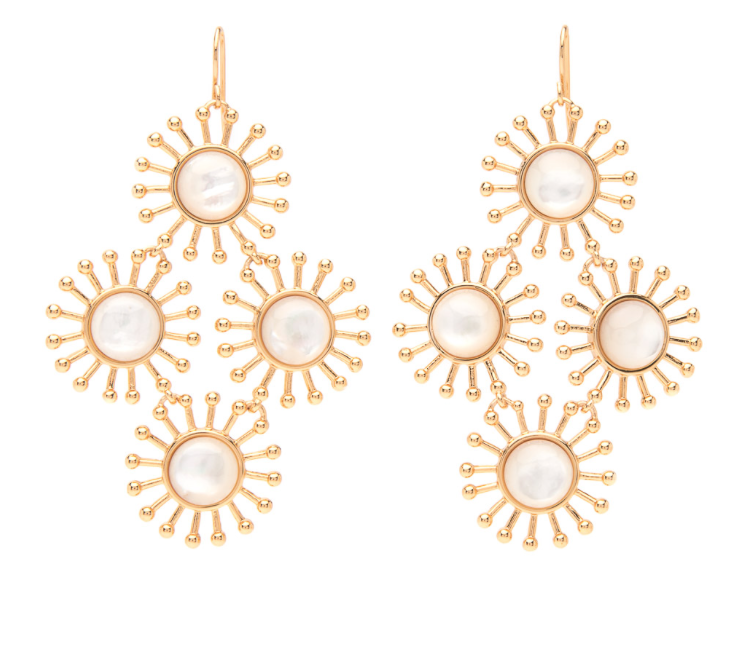 Skip the usual sequin number for some sparkly jewels instead! 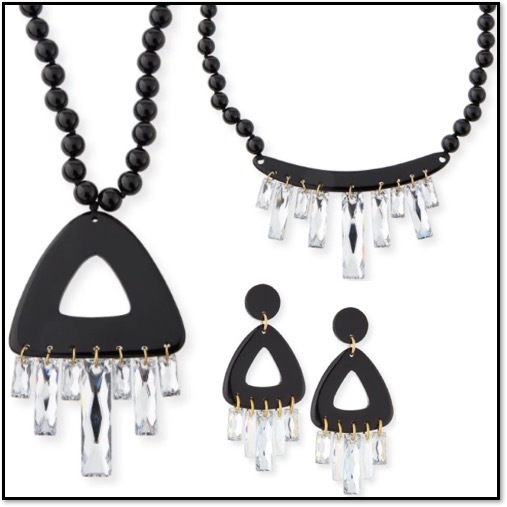 Our black horn and crystal set is the best way to add some pizazz without going overboard. 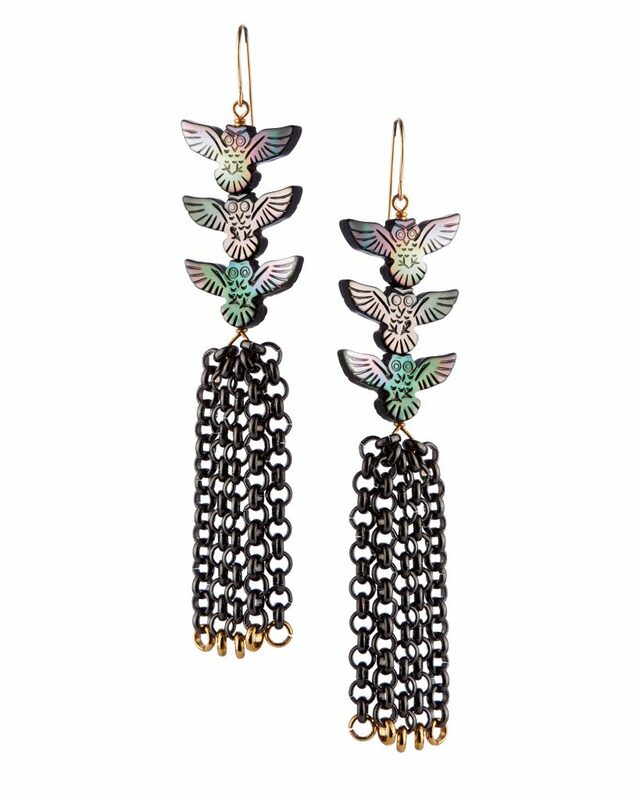 The crystals reflect light and will shimmer all night, and you will be glad you chose to end your year in these NEST pieces! We’re seeing it everywhere from cowboy booties to peasant tops – there’s no doubt the American Southwest is an important influence this season. 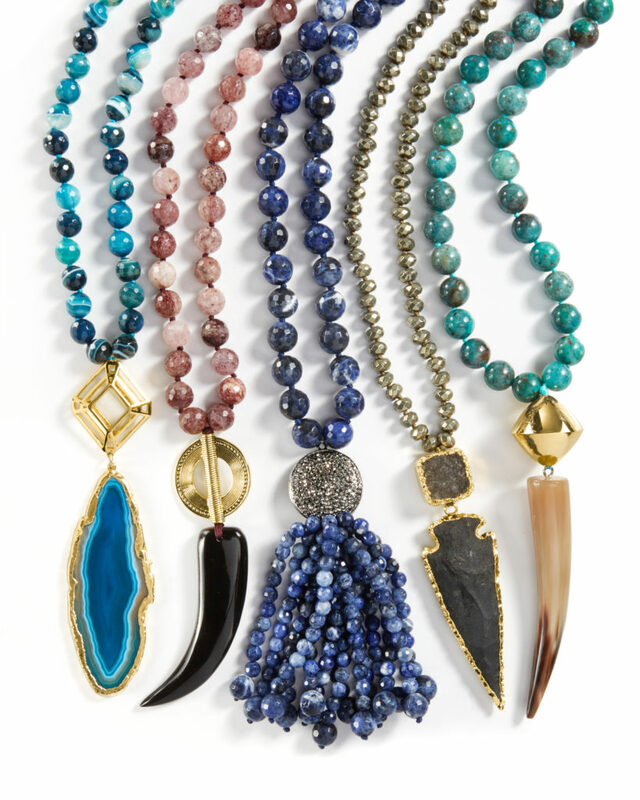 Our go-to that plays into the trend is none other than our multi-colored beaded necklaces. 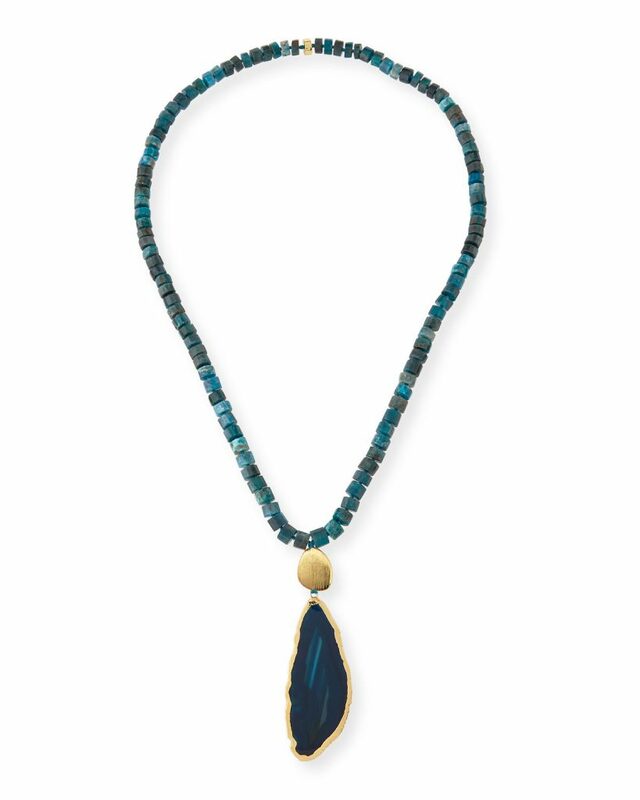 The combination of malachite, turquoise, lapis, tiger’s eye, and horn gives this accessory a southwestern feel while still being incredibly wearable. Want a neutral option? Arrowheads are always a unique addition to an ensemble. Forget past associations of charms being only for bracelets – our new favorite charm accessory? The charm statement necklace of course! True to the NEST brand, we use collections of natural stone and horn pieces in our handmade necklaces – giving it a nostalgic heirloom feel. Like to stay one step ahead of the trends? 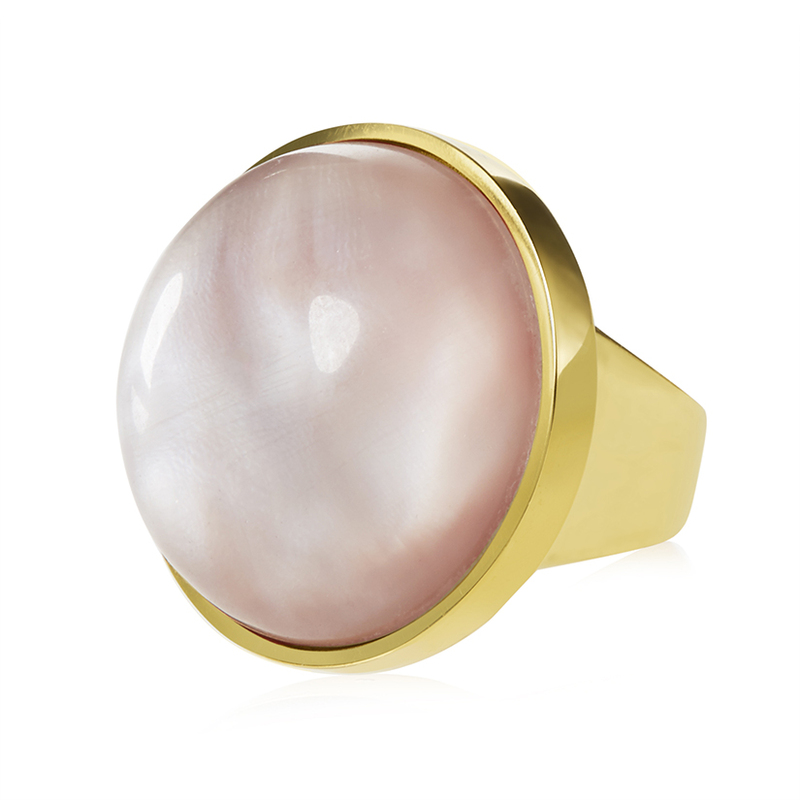 Add these charm rings to your line up for an über-stylish look. 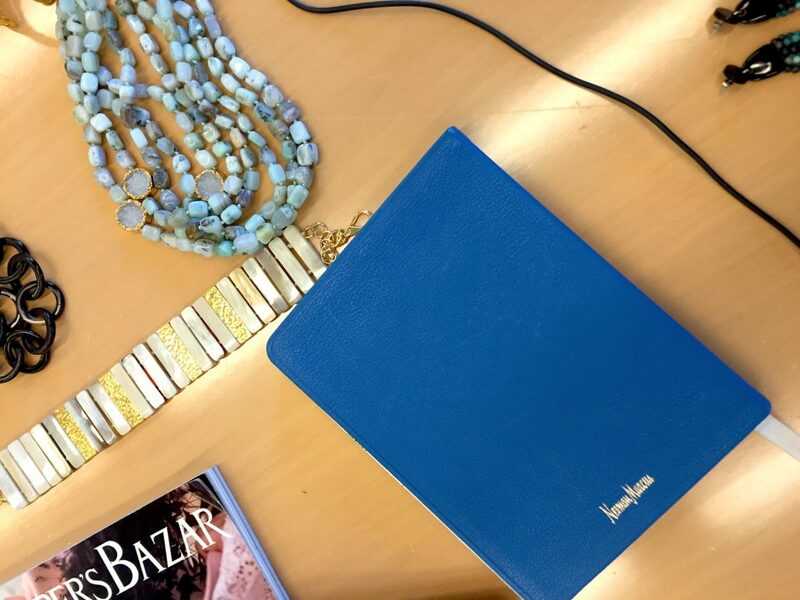 Blues are having a major moment – our very favorites being the rich royal and playful peacock hues. 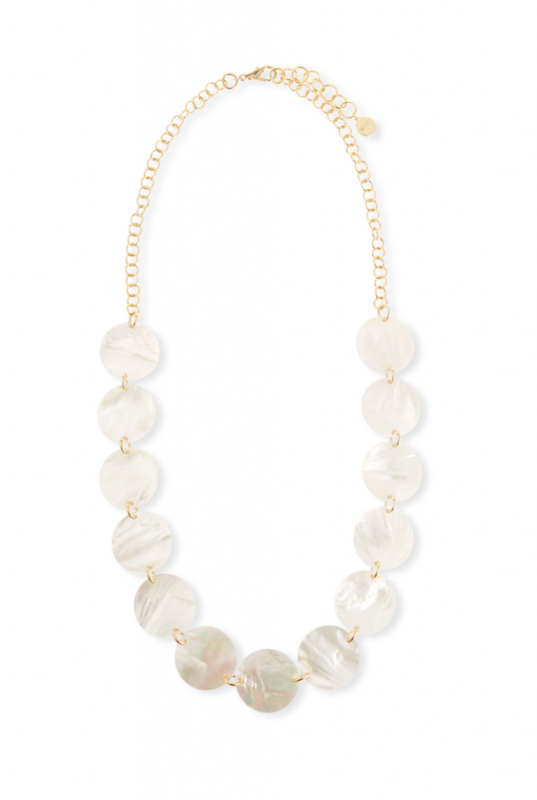 Go for a classic statement necklace with natural stones for an organic feel this season. Try mixing different shades of blue in your wardrobe for a chic monochromatic look. 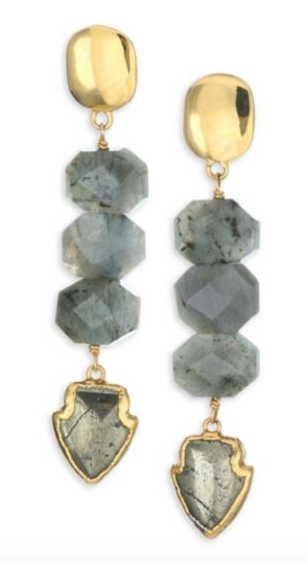 These blue drop earrings are sure to elevate any ensemble. This season’s pearl update is here – and in the most gorgeous shades of grey. 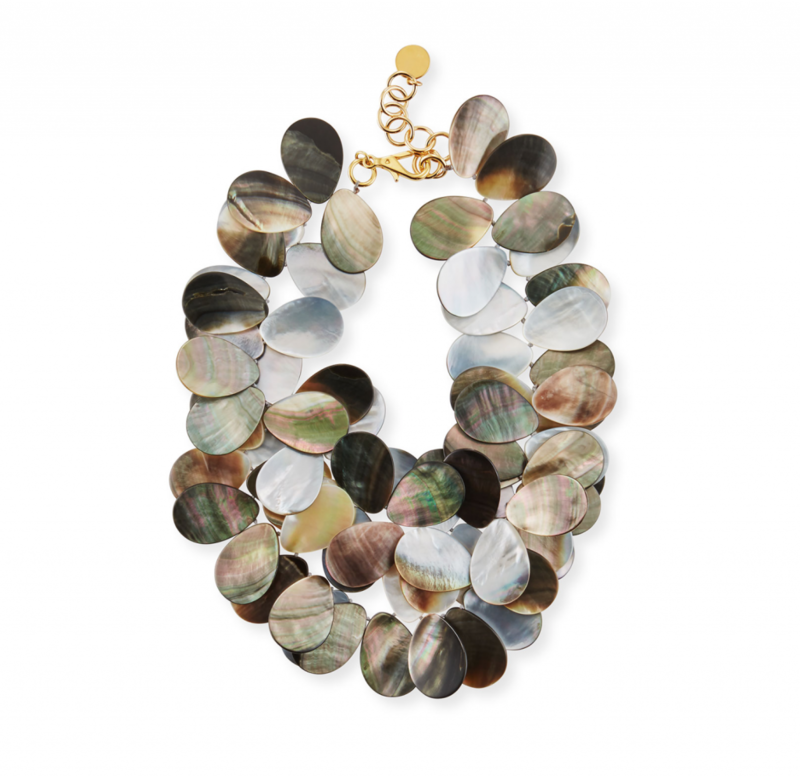 We love the subtle but chic hue in these chunky necklaces. Layer over a cozy sweater for a put together laid-back look. Want a little more va-va-voom? 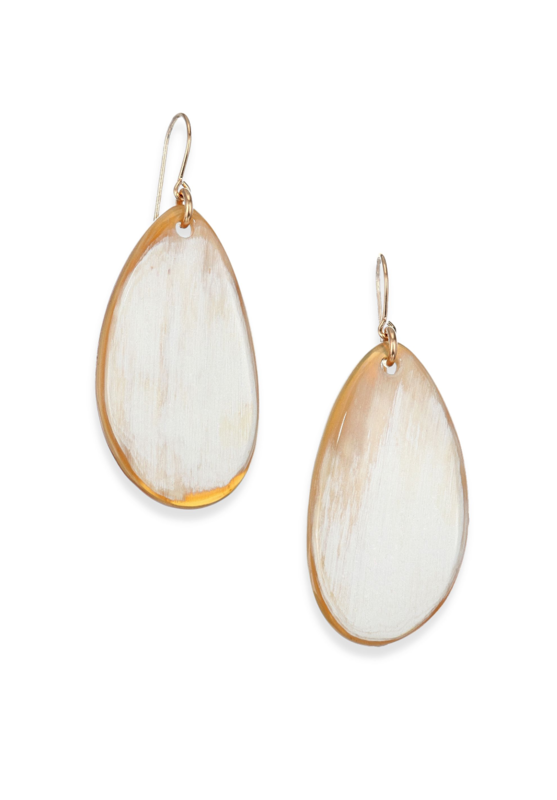 This mother-of-pearl carved owl set is this season’s best conversation piece. Its no secret animal prints are a fall staple. Our take on working the trend into your everyday outfits? Add our beloved spotted horn accessories into the mix! 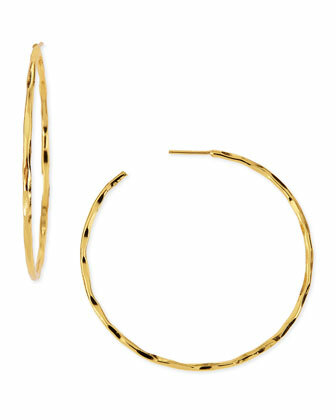 Use to complement a classic neutral outfit or style with bright colors and patterns if you’re feeling fashion-forward. Can’t get enough? You won’t regret having all of these classics that will stay relevant throughout the seasons. Now that my looks are covered, we can focus on the gifts. For the graduates I am sending earrings, earrings, and earrings! 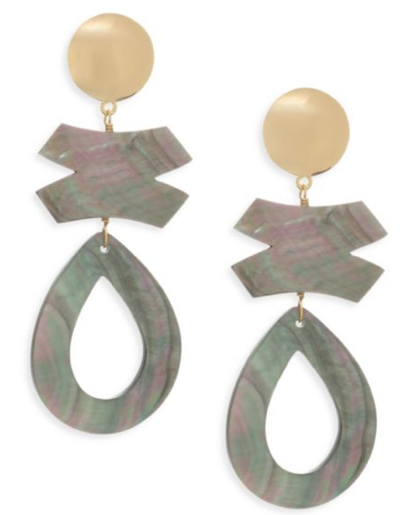 We hear from a lot of you that you want clip earrings and we listened! 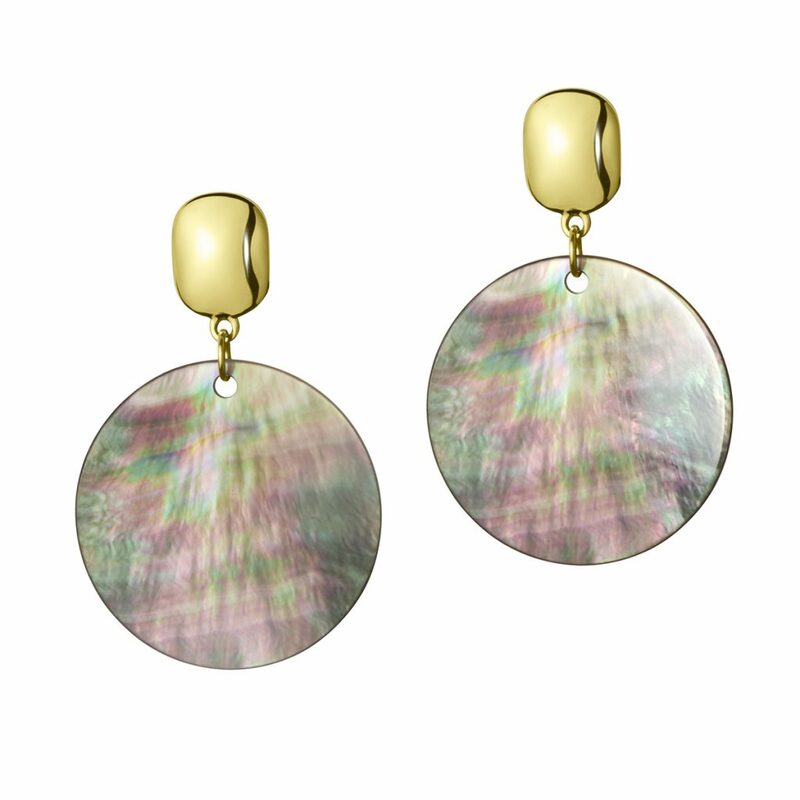 We currently have an entire collection of Mother-of-Pearl Clip Earrings so all the world can enjoy a beautiful NEST statement earring with more styles to come. 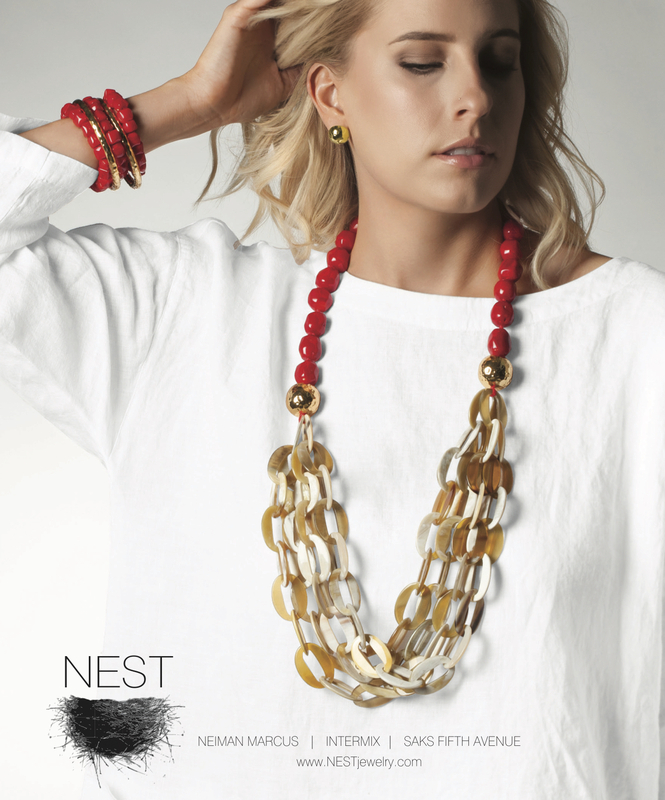 We send each of these beautiful pieces to you with love and hope that you will BE BOLD – WEAR NEST – and MAKE A STATEMENT! The start of New York Fashion Week has me reminiscing on my recent trip to the Big Apple. My days are filled from sunrise to sunset with buyer and editor meetings but I love the energy of the city. 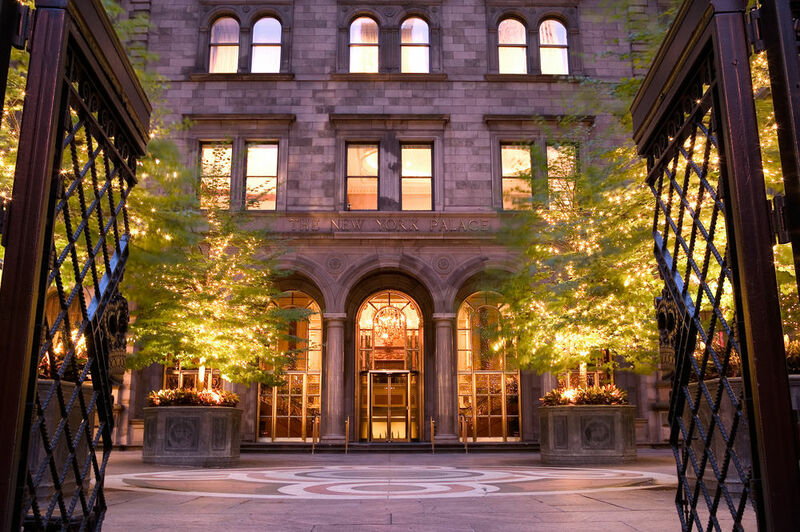 Lotte New York Palace is my favorite place to stay. 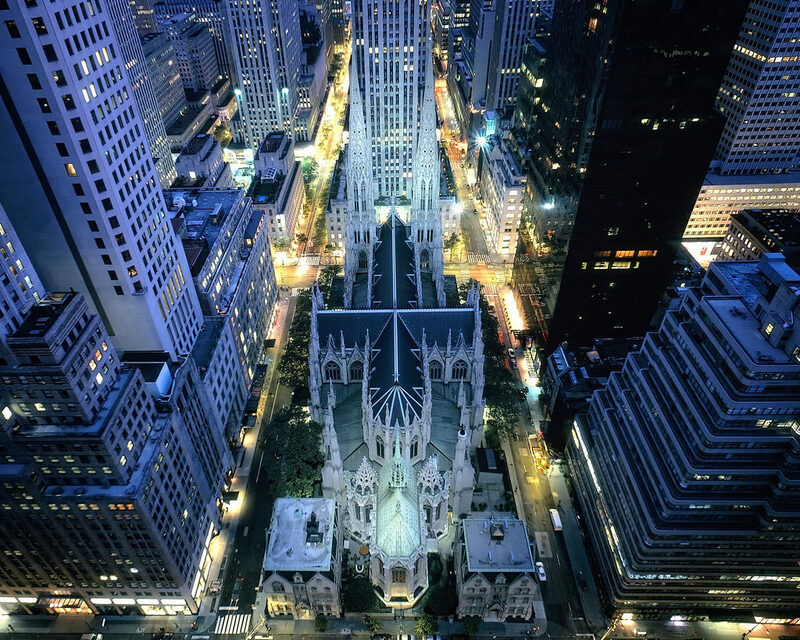 Every morning I sip my earl grey tea while taking in the view of St. Patrick’s Cathedral in a quiet room high above all the noise. 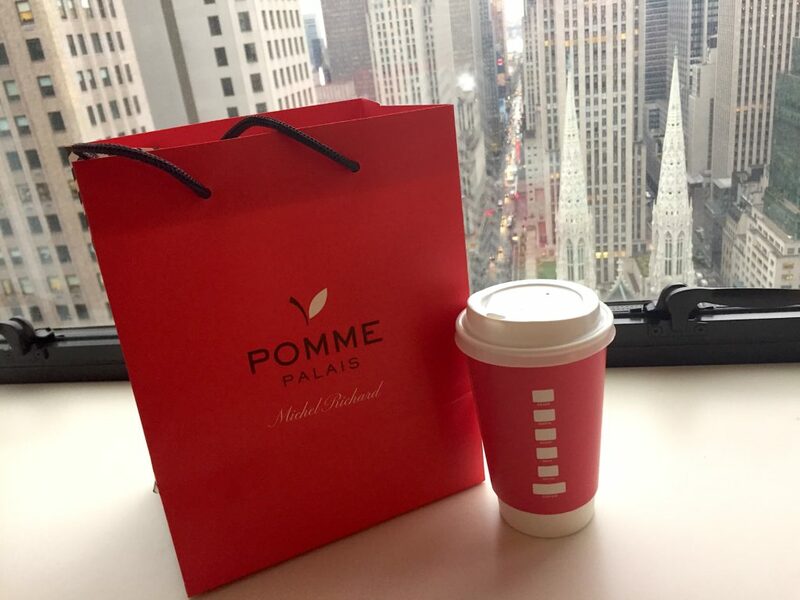 I’m always eating on the go and the Lotte New York Palace has the cutest French style bakery, Pomme Palia. I’ll grab a croissant and refill my earl grey tea and I’m off! This was truly a dream for me! 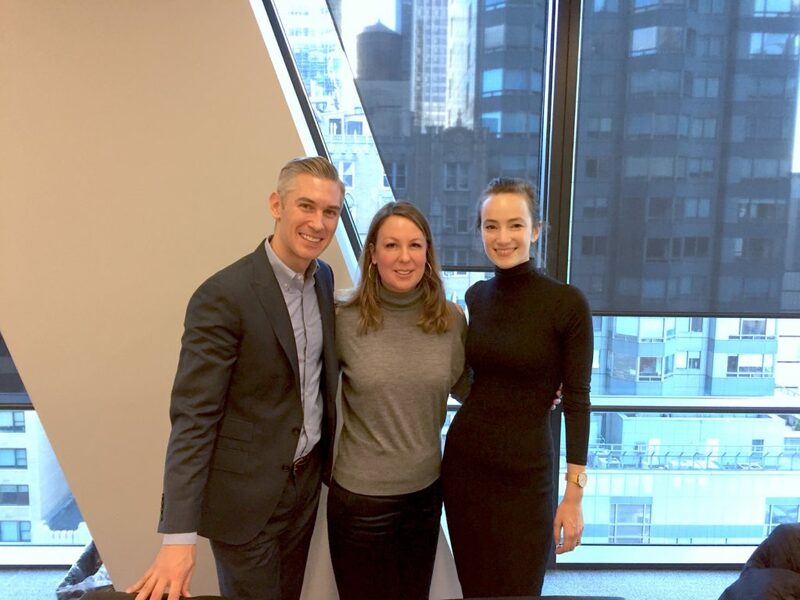 I met with editors from Harper’s Bazaar, Marie Claire, Town and Country, O Magazine and Elle. 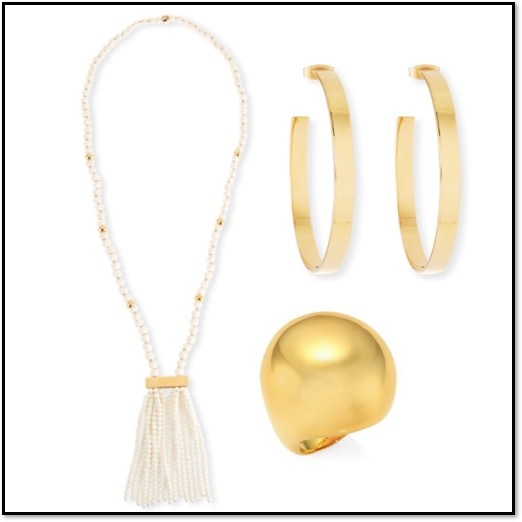 Our statement earrings and Horn Choker Necklace were their favorite pieces from our spring line. 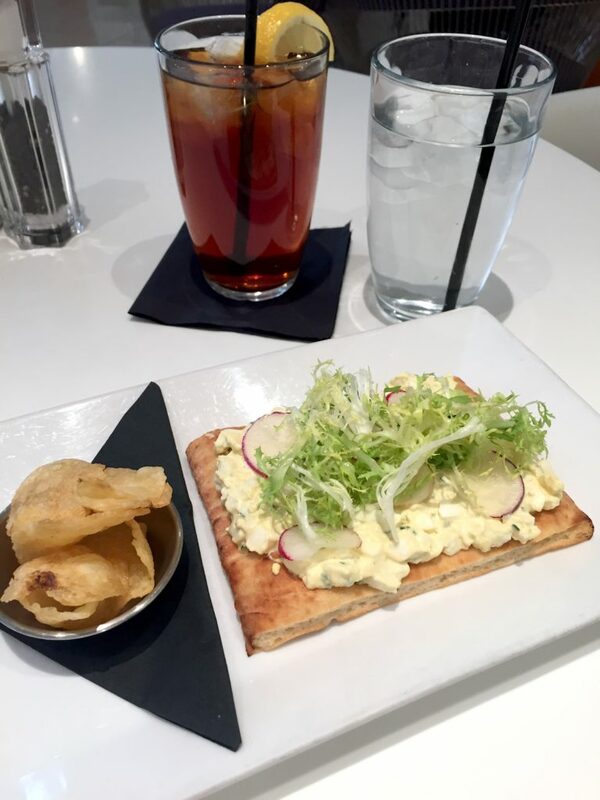 After leaving Hearst I grabbed a quick bite at Bergdorf Goodman Café. 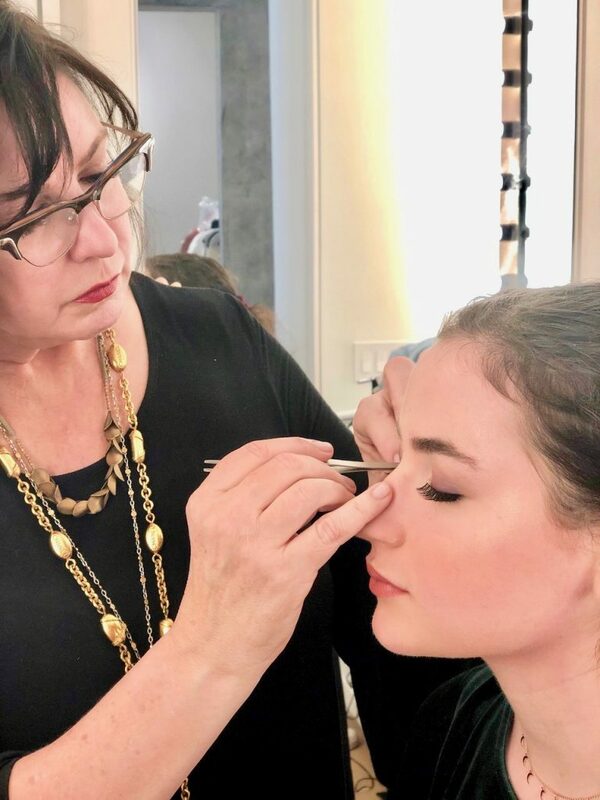 Julian Gold has been offering customers the best designer selections since 1945 and we are thrilled our line is available throughout their four locations in Texas. Now it’s time to hail a taxi! I have a long ride to Brookfield Place to meet with Saks Fifth Avenue. 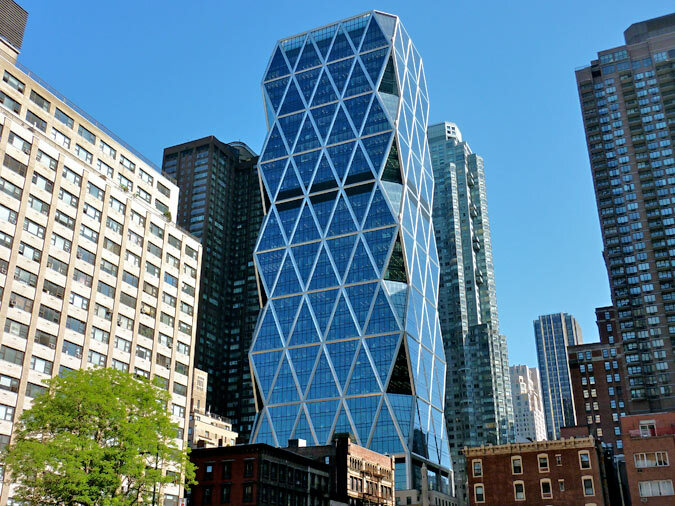 Their new downtown office is sleek and modern and has sweeping views of the Hudson River. 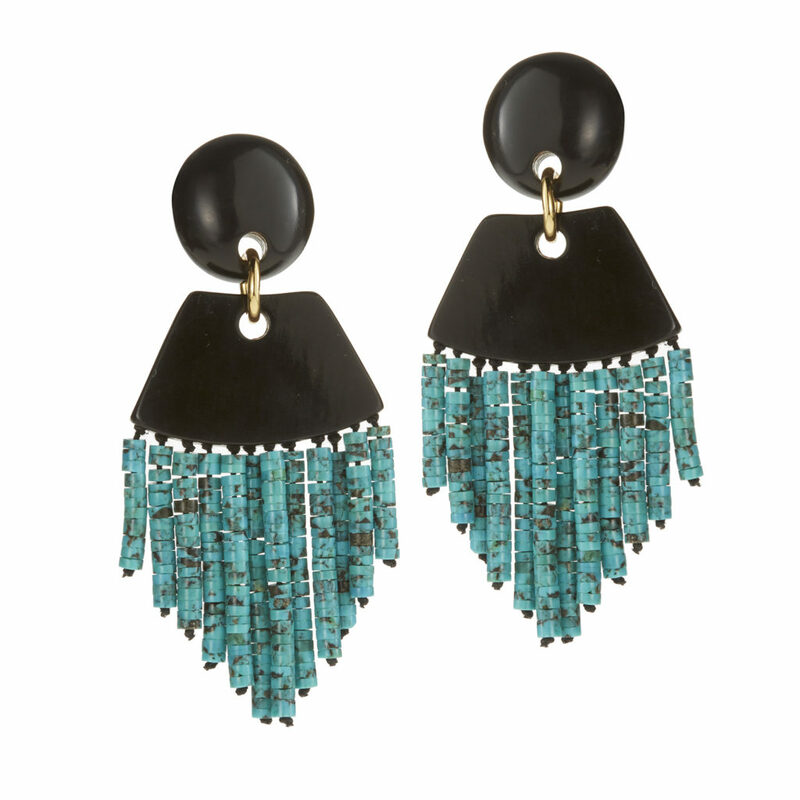 They also loved our statement earrings and Amazonite Statement pieces. For my last meal of the day I lucked out and came across a hidden burger joint in Le Parker Meridien. It was absolute burger perfection. The next day I had several morning meetings before I had to jet off to the airport. There is never enough time in New York City! 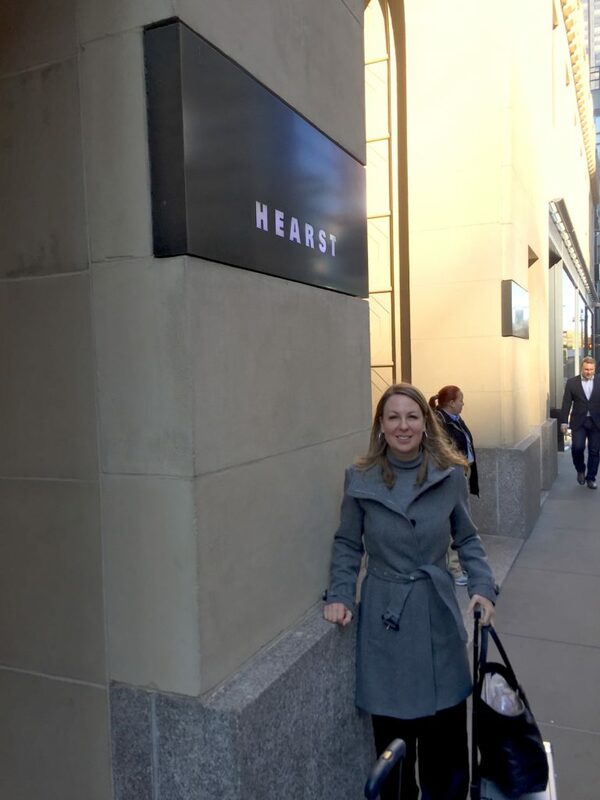 My last stop was in downtown Manhattan to meet with Halsbrook. 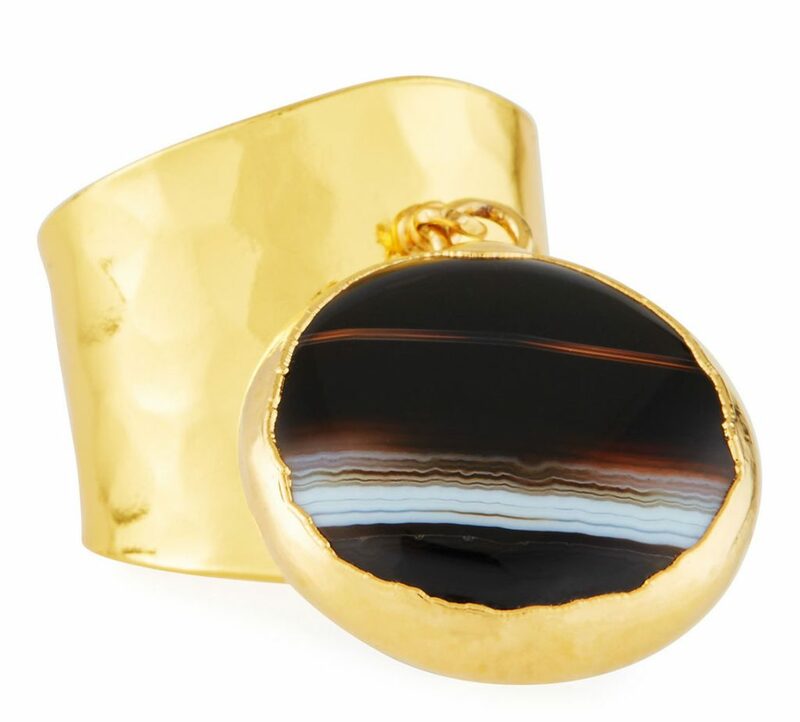 Our bold pieces blend well with the classic clothing carried by this online boutique. 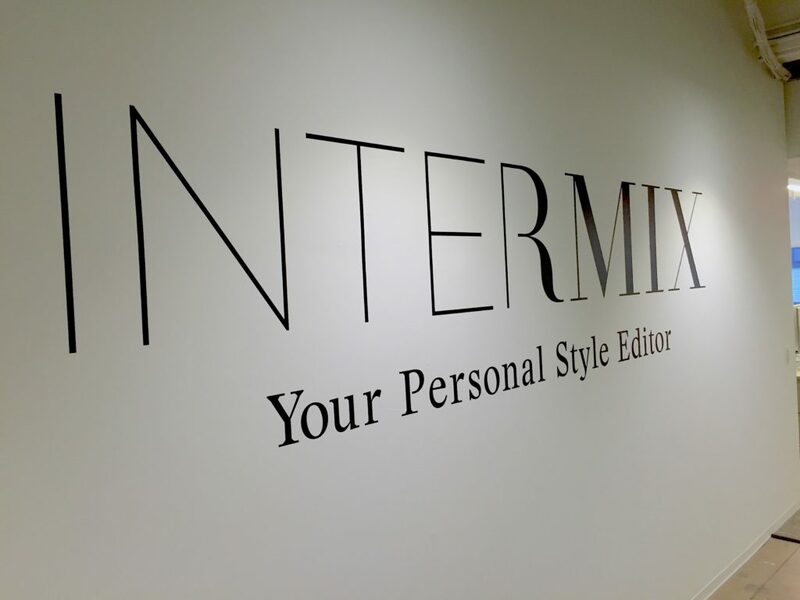 Their turquoise-toned office is super cute and I always enjoy catching up with them. With my trip wrapped up, I start sketching new designs on the flight home. New York City gets me so inspired! I am already looking forward to my next visit. 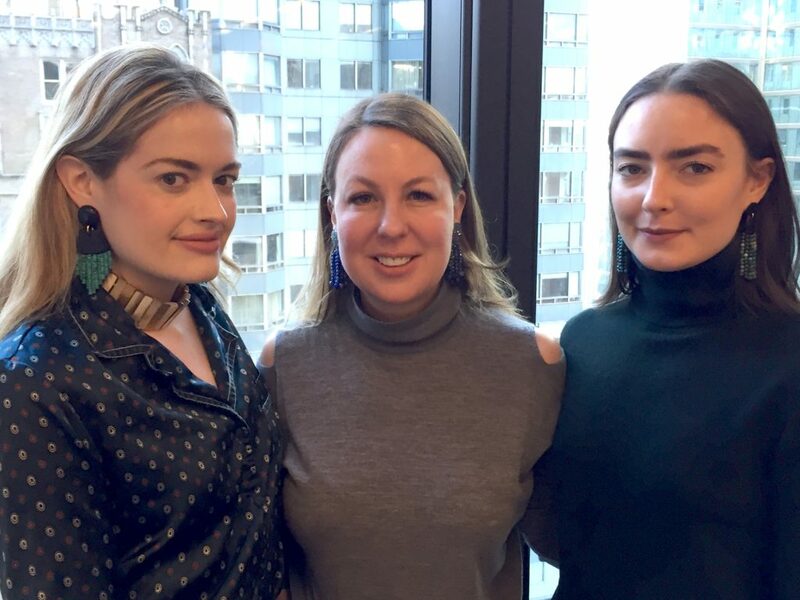 NEST Jewelry’s Creative Director and Co-Owner, Janette Wilkinson, sat down with Neiman Marcus to discuss her vision behind the brand. 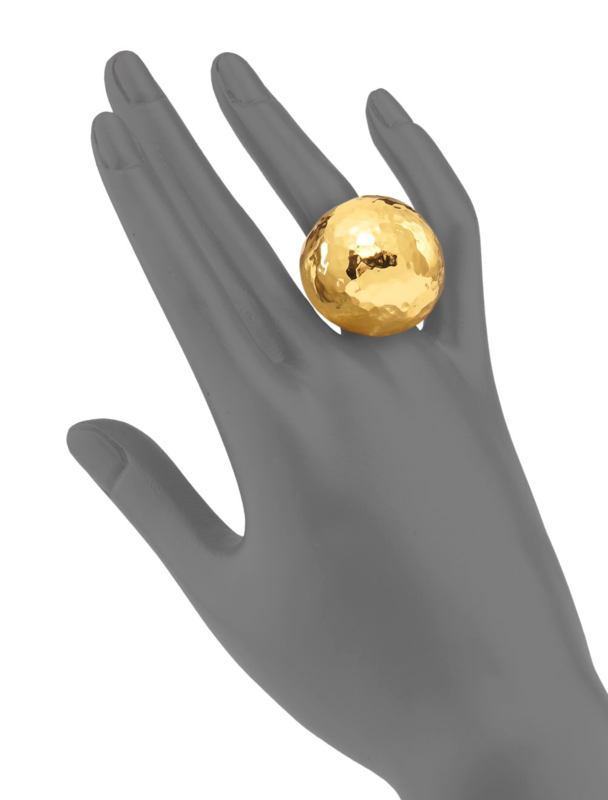 Neiman Marcus: Tell us about your journey toward becoming a renowned jewelry designer. Janette Wilkinson: It happened mostly by accident. Since a very young age, I have always loved fashion. My earliest memories are of playing in my grandmother’s costume jewelry. I grew up in a small town in Oklahoma, so I didn’t have access to fashion outside of magazines and catalogs. I was pretty good at math and science, so I was encouraged to pursue engineering. I graduated with a degree in electrical engineering and then worked in the semiconductor industry for ten years. I really enjoyed working in semiconductor, even though I wore a protective suit that covered me from head to toe—not so fashionable. 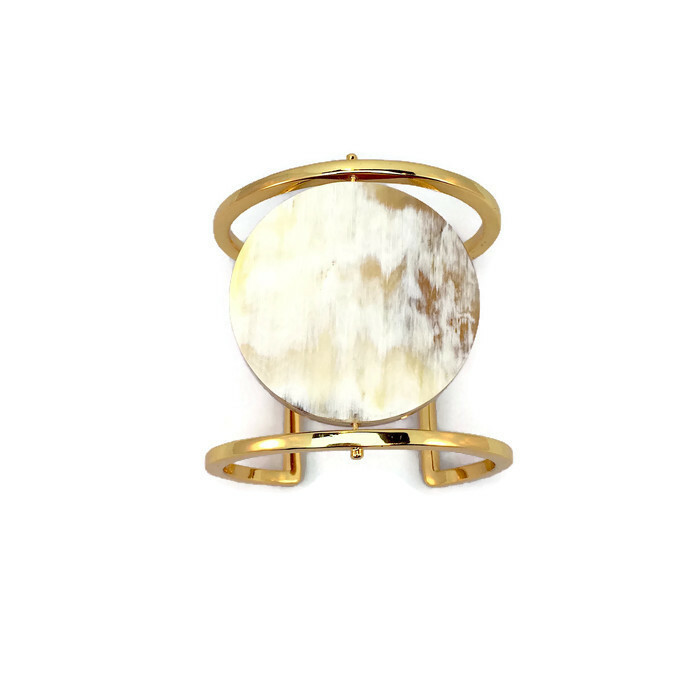 The first pieces of jewelry I designed were just for myself. Red coral jewelry was a big trend, and I wanted a coral necklace that had a bold scale, but was still simple. I couldn’t really find what I was looking for, so I decided to make it myself. 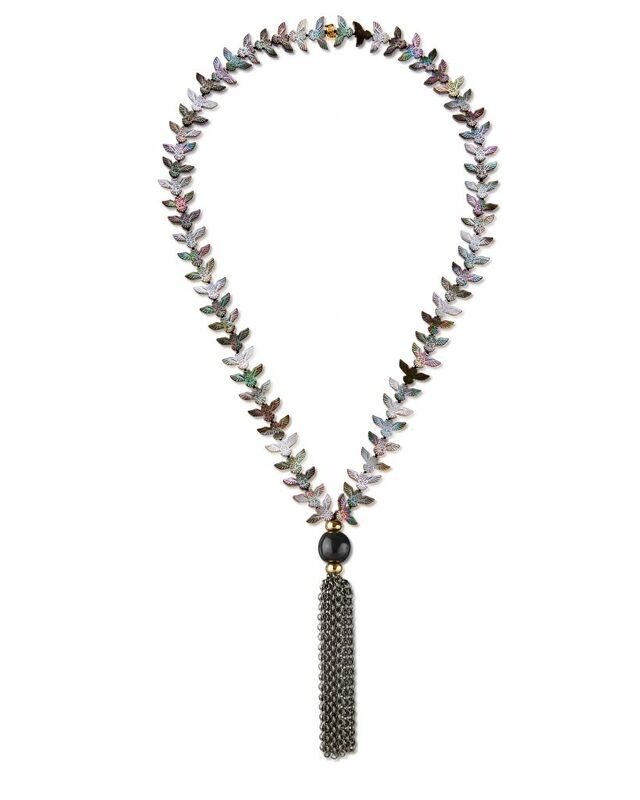 One day I was in Neiman Marcus NorthPark shopping for a gift and five people stopped me to ask where I had purchased my necklace. 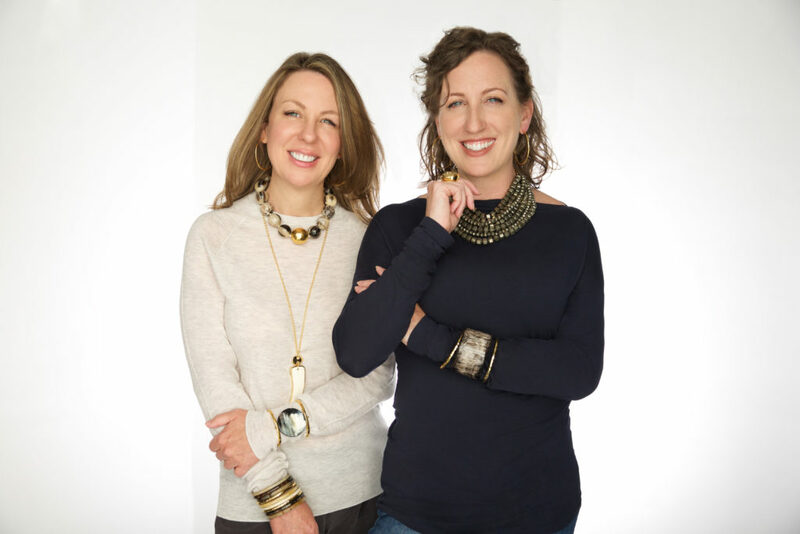 I immediately called my sister, Jana Erwin, and the next thing you know we were partners in a jewelry business we named NEST. NM: And the name NEST, where did it come from? 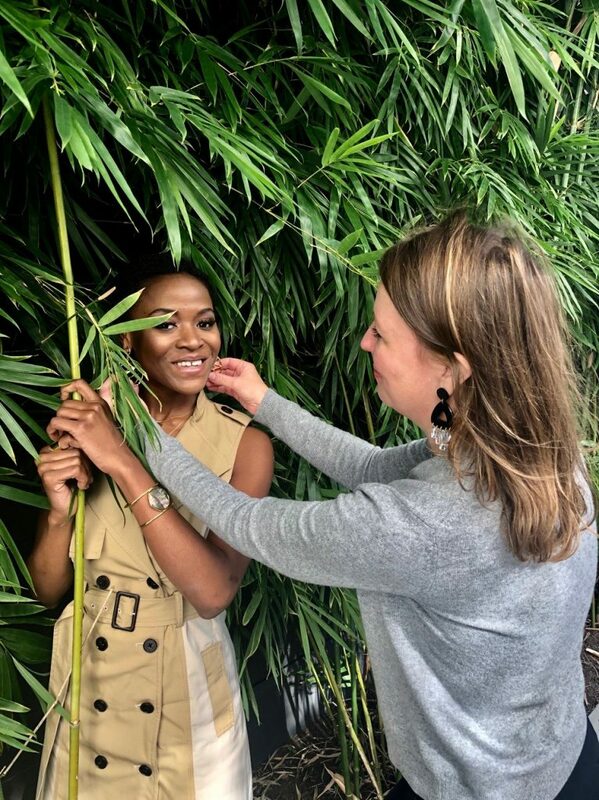 JW: When Jana and I began brainstorming the name of our jewelry line, we wanted something that emphasized the natural, bold, and simple nature of our pieces. 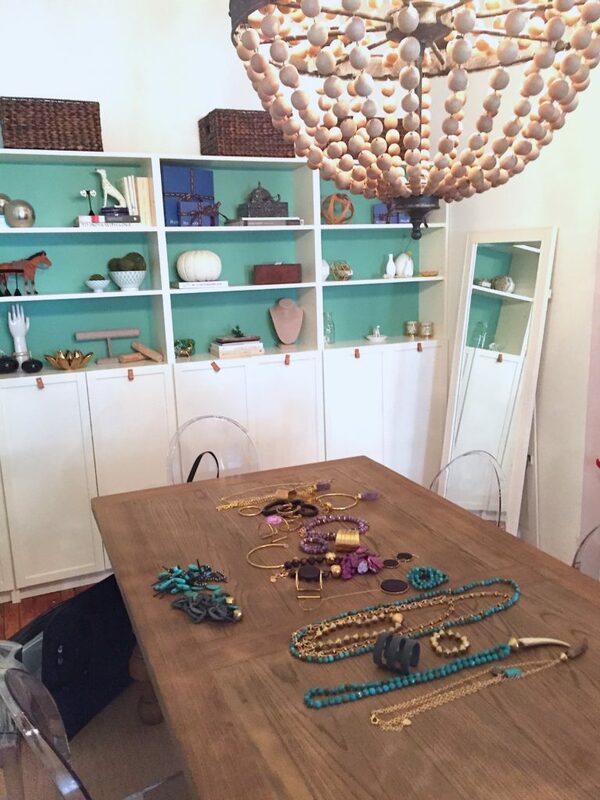 We were traveling around the world collecting things and bringing them back home to create our collections. We felt like birds gathering their natural materials and bringing them back home to create their nests. In that discovery, the name NEST was born. NM: We love family-owned businesses. 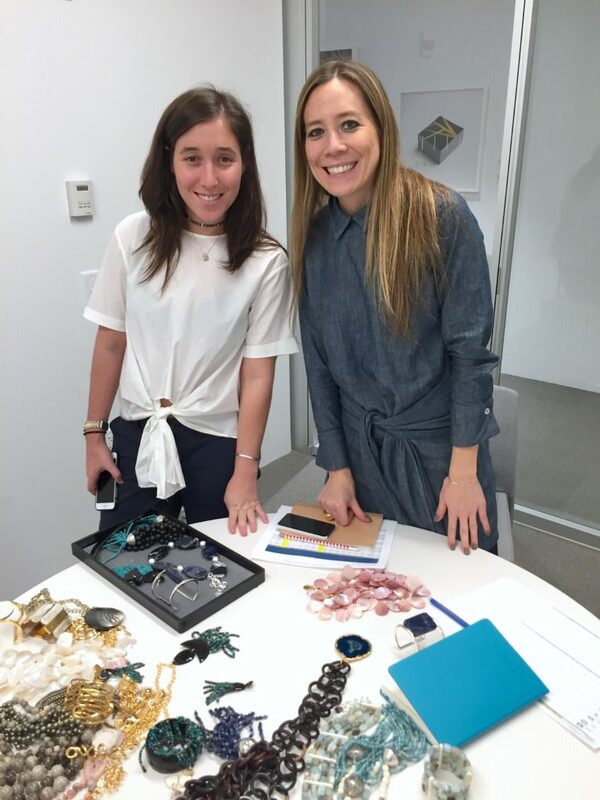 Tell us how you and your sister decided on partnering together to create NEST Jewelry. JW: My sister is an accredited Interior Designer and was running her own high-end design firm in Houston. 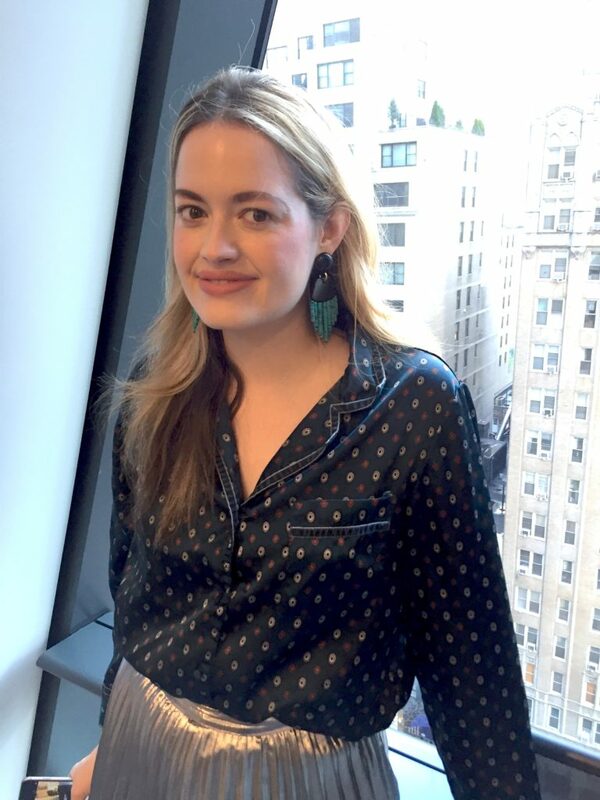 She understood the details of starting a company, which allowed me to focus on the fashion. Although she is our CEO, it is nice to have another creative eye to look over the pieces that I am working on. We have gradually turned NEST into a family business. I have a very close family that enjoys working, playing, and even traveling together! We have vacationed together in some beautiful places including Greece, Scotland, Mexico, Costa Rica, The Bahamas, and many beaches, mountains, and lakes across the U.S. Our vacations always end up being a great time for vision planning, and over the years my nieces gained interest in listening to our business meetings. After my oldest niece graduated from college, she started working for us, helping with production and also PR. And my younger niece often models our pieces. 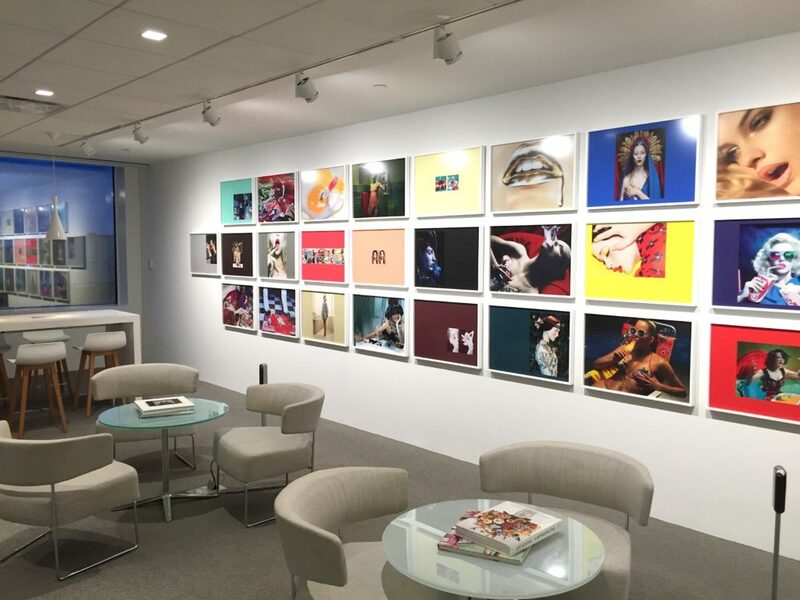 NM: Where do you find inspiration designing new collections, season after season? 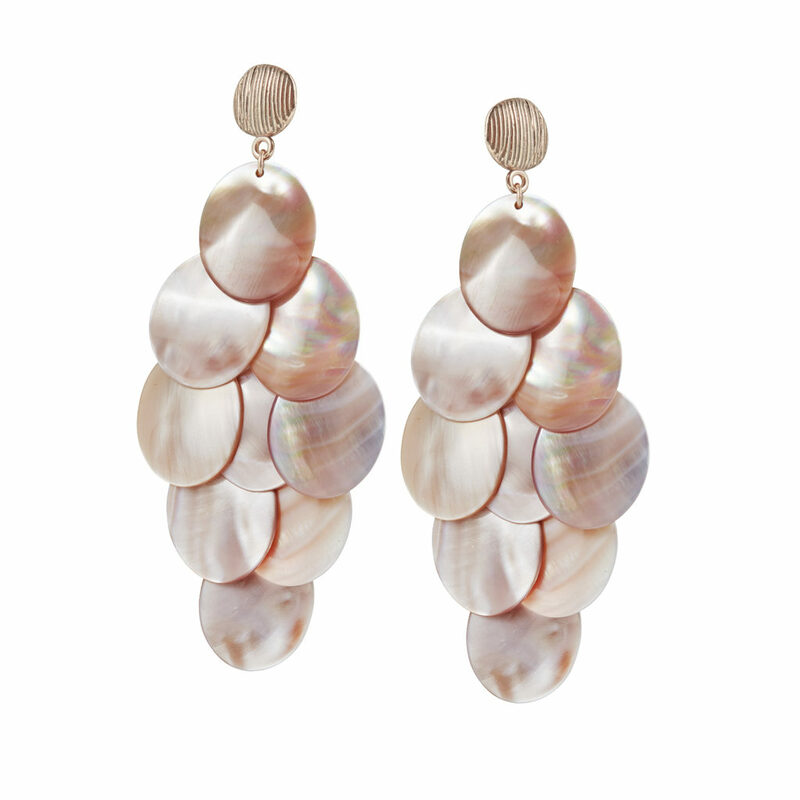 JW: Nature — every piece of jewelry we make has some sort of natural element. 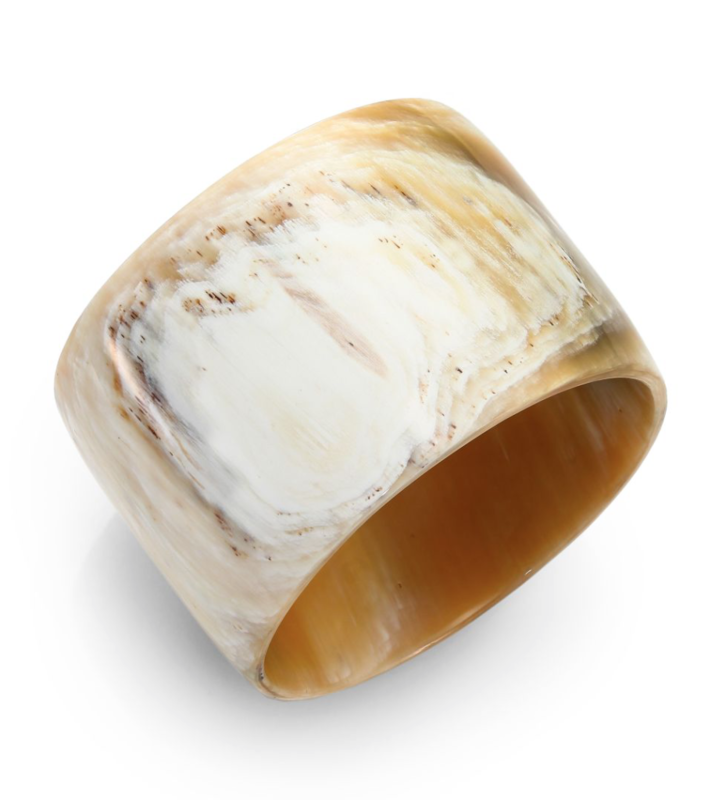 Over the years we have used stone, wood, horn, bone, metals, leather, stingray, and even shark’s teeth. We keep our materials authentic. 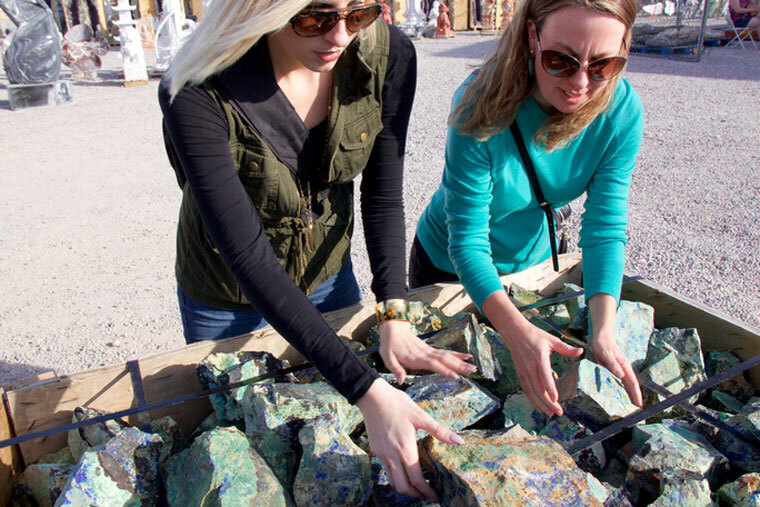 When we select stones, we let their inherent beauty begin the design process. After we determine the perfect cut of stone, we begin enhancing it with hand-trimmed gold, hand-knotted silk, or we add other natural products like horn. 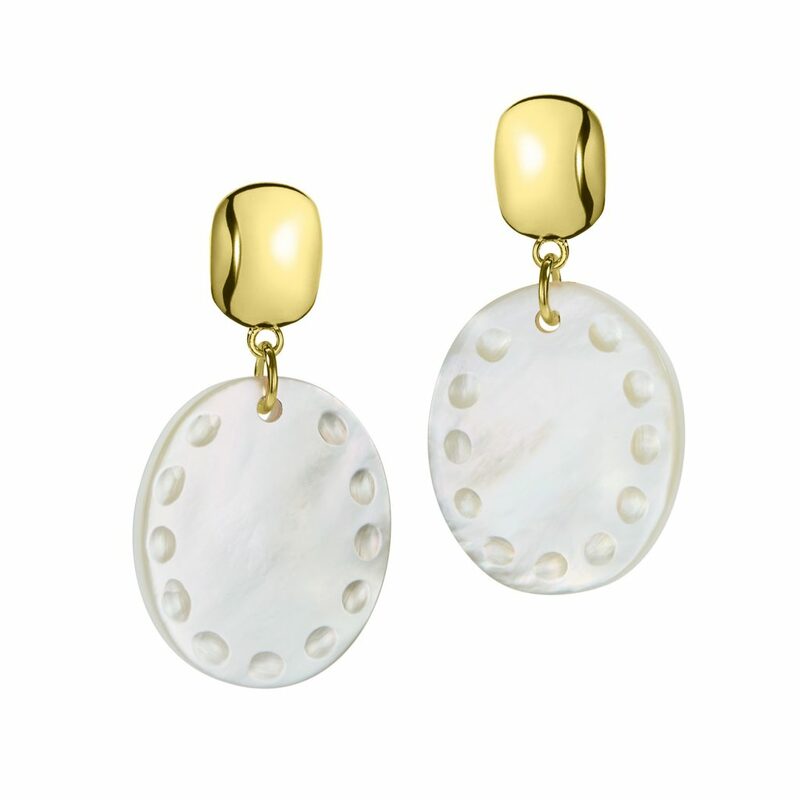 Our customers often tell us that they love the way our pieces feel as much as they love the way they look. 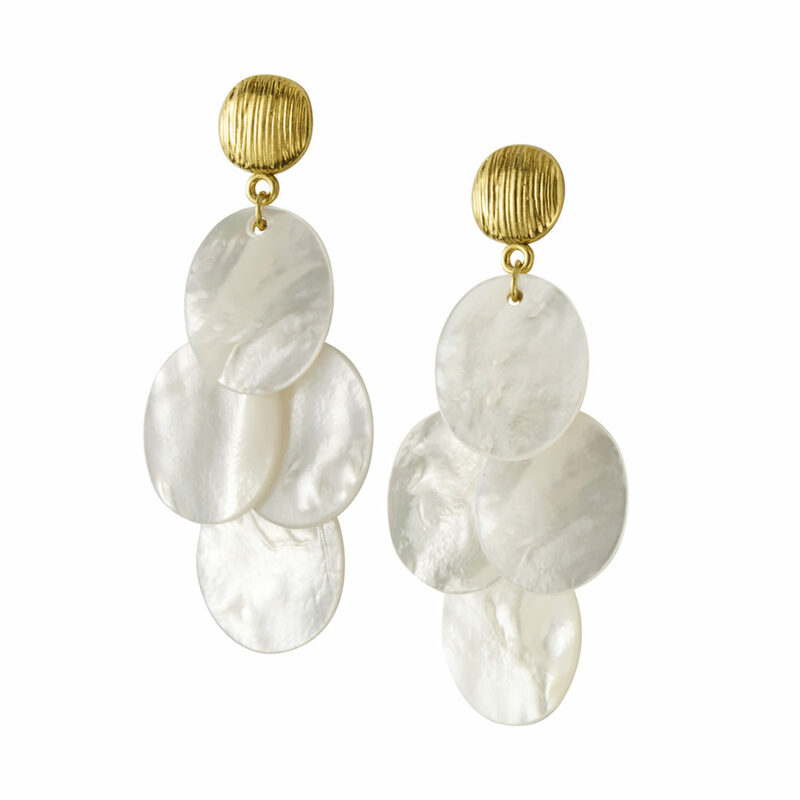 The natural energy that the stones carry and the attention to detail and handmade quality truly come through. 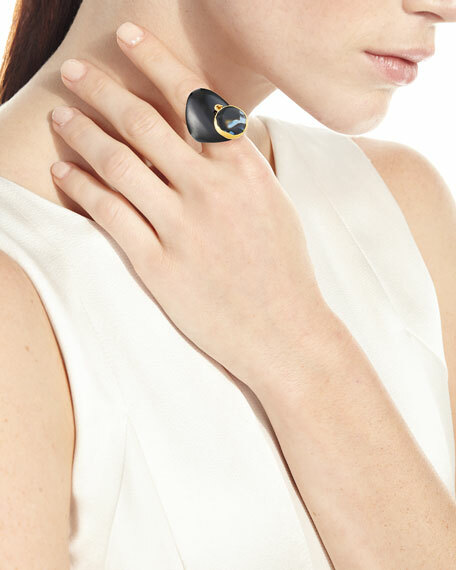 NM: Hard to narrow it down, we know, but what is your favorite NEST piece? JW: Definitely our Cluster Necklace! 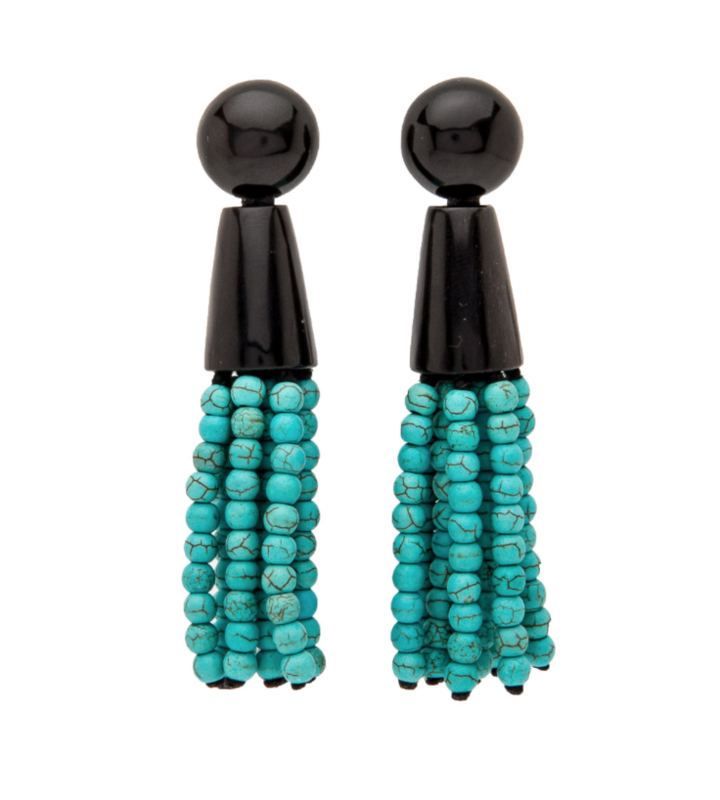 We’ve created this style in many different colors of turquoise and jasper, mother-of-pearl, and even horn. 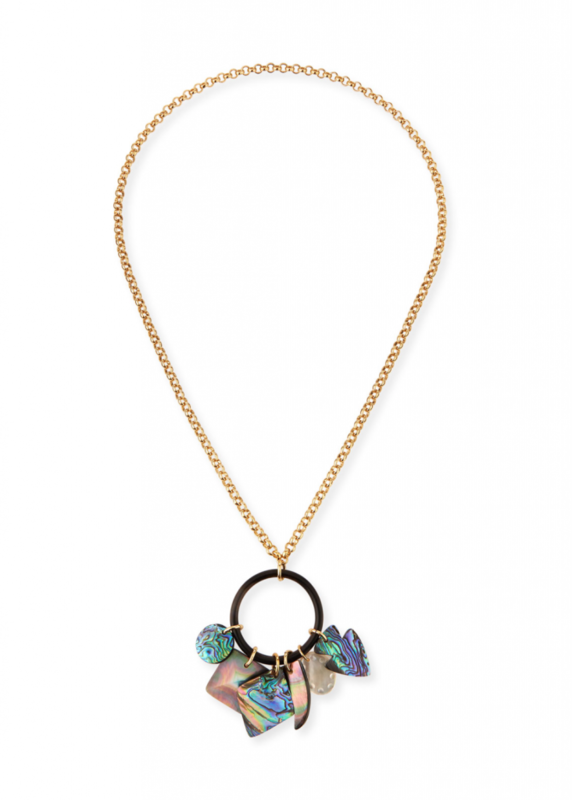 The NEST Cluster Necklace is the definition of a statement piece! NM: Can you give us a sneak peek into where you think the fashion industry is headed and how NEST fits into that world? JW: I think there is such an appreciation and longing for things that are made by hand with natural materials and for pieces that have a story. 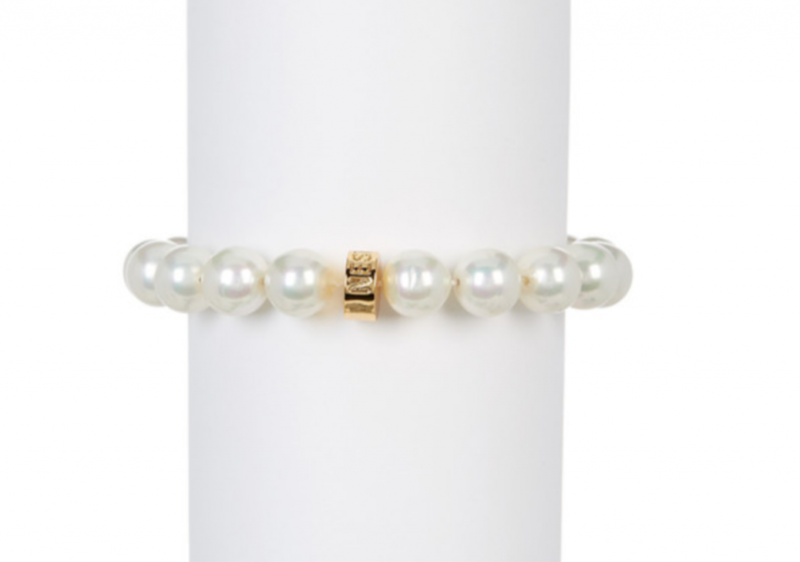 Jewelry needs to feel special and unique, and that is exactly what we do! 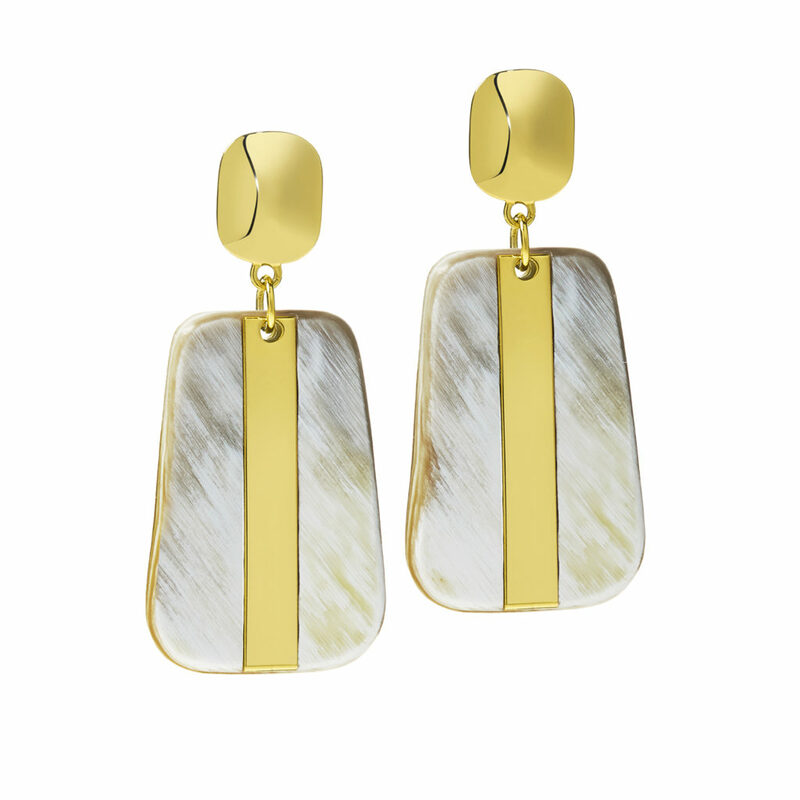 Shop the latest from NEST Jewelry at NeimanMarcus.com. 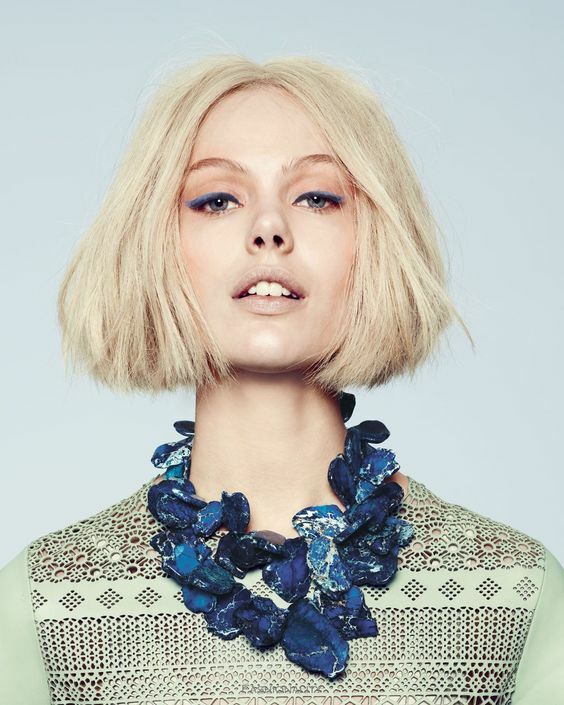 Big or Small – Short or Tall – Statement necklaces are for everyone. 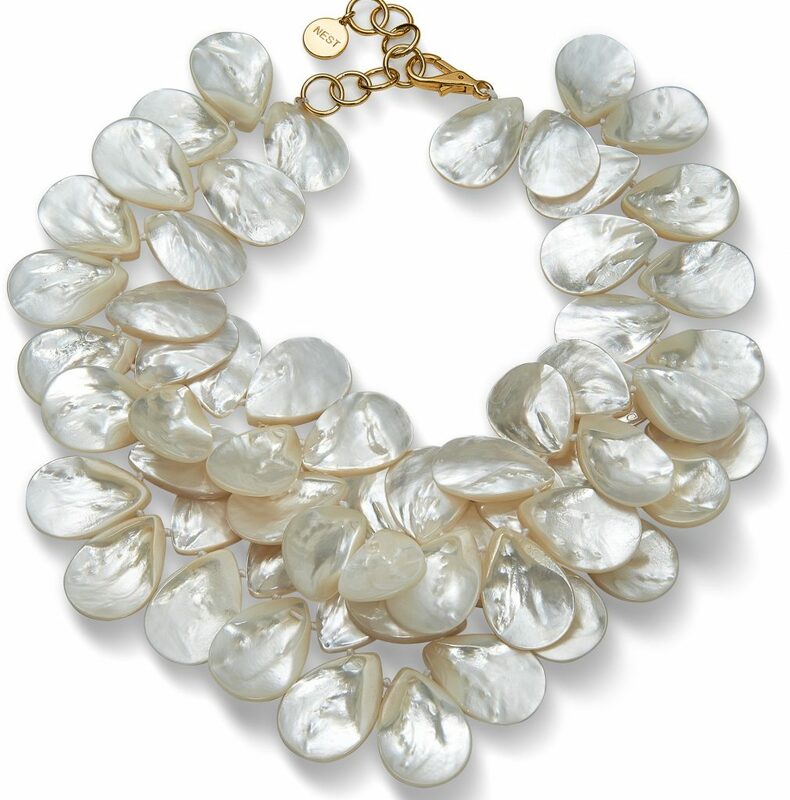 Over the years I have converted many skeptics to love the statement necklace. 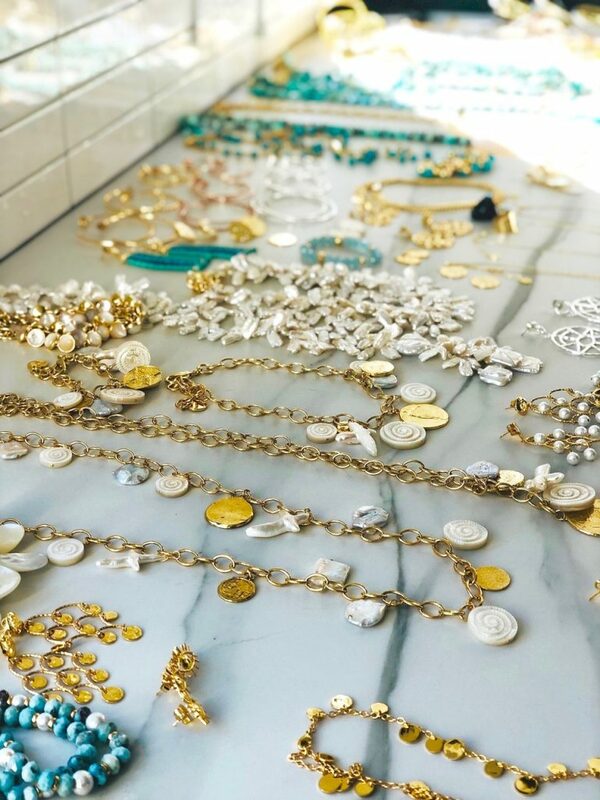 I have heard it all, “I love big jewelry but it just doesn’t look good on me,” to “I’m too small,” or even “I’m too big.” At NEST we make sure there is something for everyone. 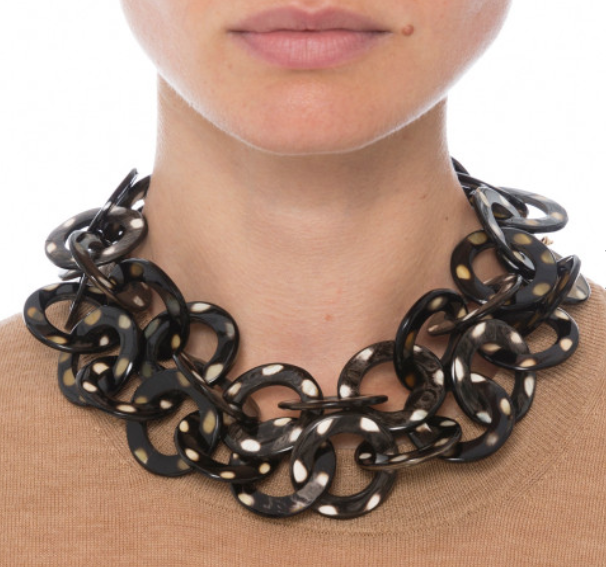 To take the guesswork out of it I have selected a few statement necklaces that look amazing across the board. 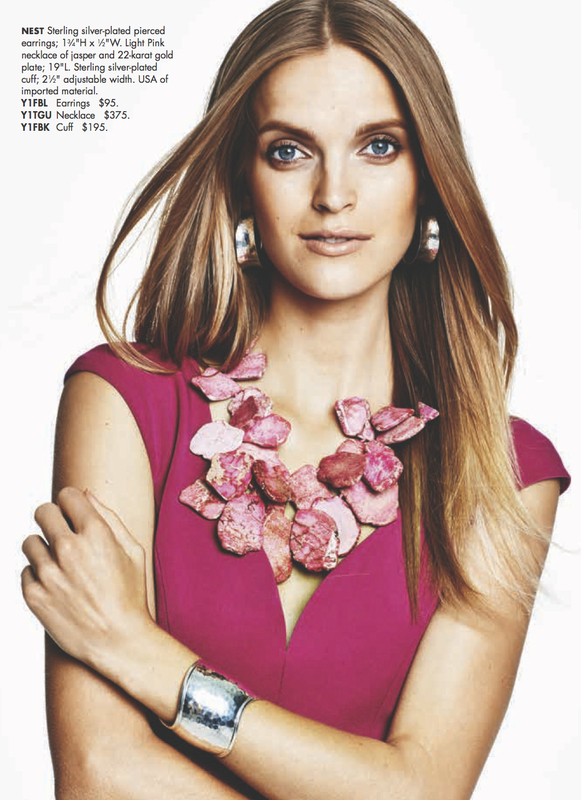 These pieces are so easy to wear and will help ease you into the wonderful world of statement necklaces. I promise you will thank me. 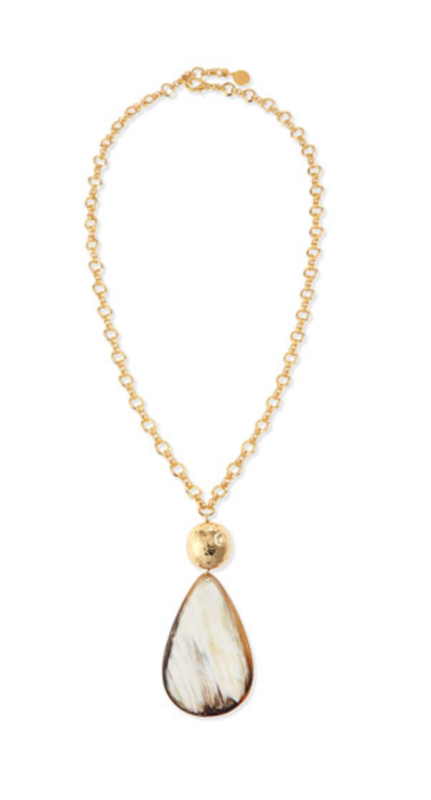 Rose Gold Pendant Necklace – This necklace will elongate your neck and the soft rose gold color looks amazing on all skin types. This is a win for anyone. It’s just a great, easy-to-wear piece that will go with anything in your closet. 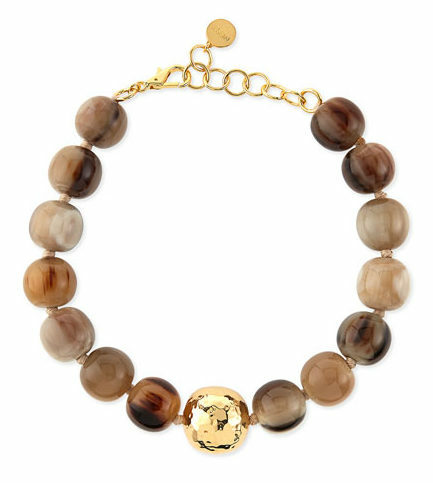 Horn and Gold Ball Necklace – The natural variations of the horn looks fantastic with light or dark hair. 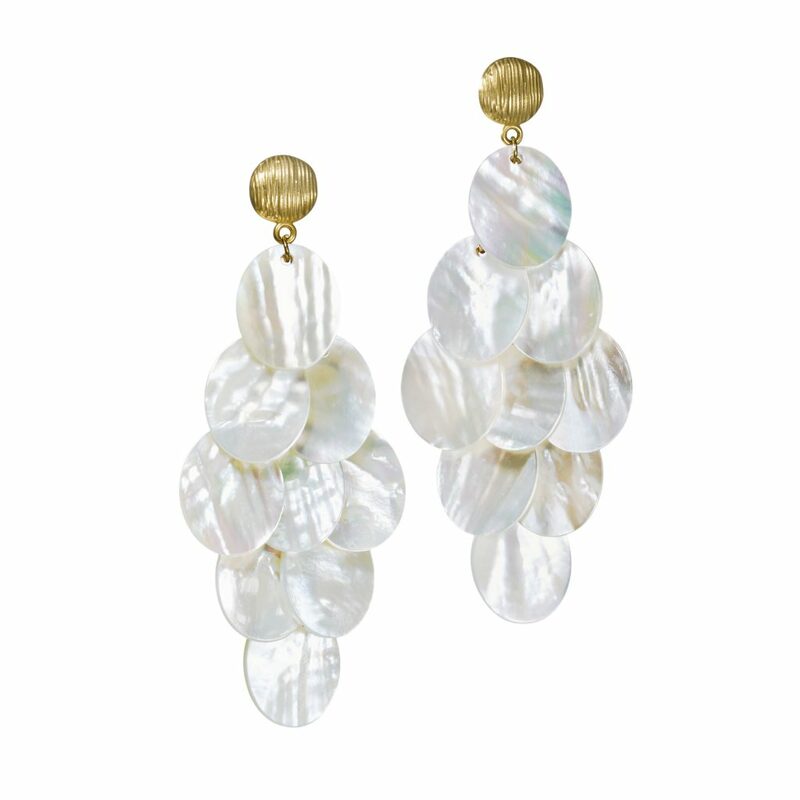 The short length makes it easily worn with any neckline. Also, since these large beads are horn they are super lightweight!! 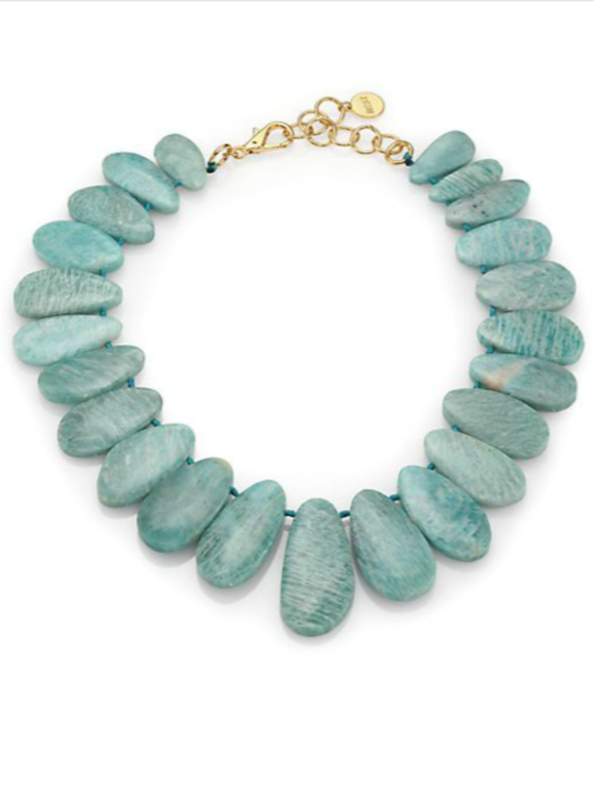 Amazonite Petal Necklace – You will not find a more flattering necklace than this Amazonite Cluster Necklace. Truly. The soft pale blue/green is flattering to all skin types and hair color. 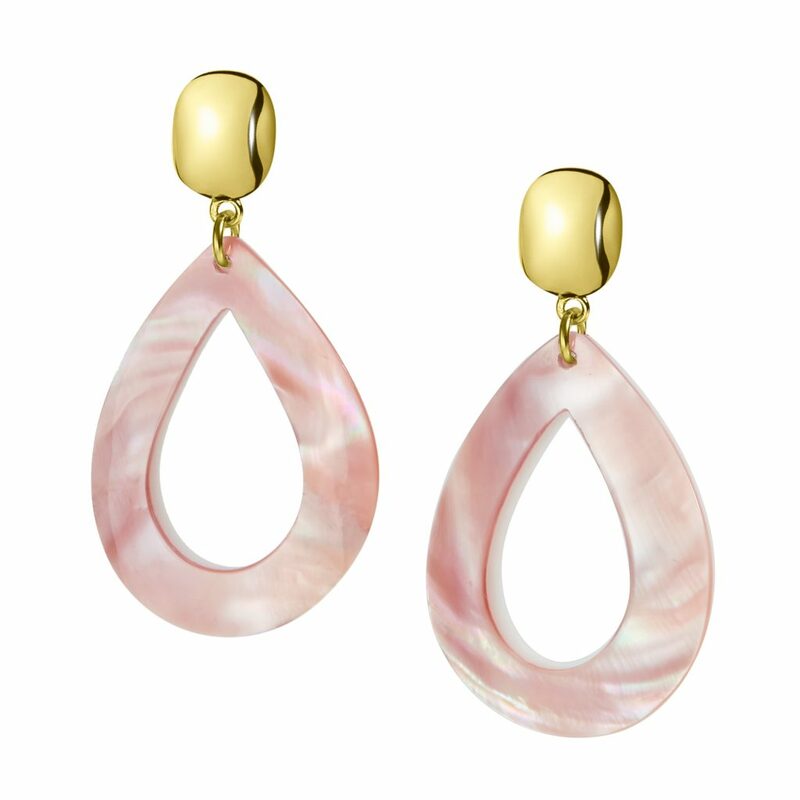 The natural rounded teardrop shape brings out all your best facial features. This color is great all year round, from brightening up your linen to adding a punch to your basic black. 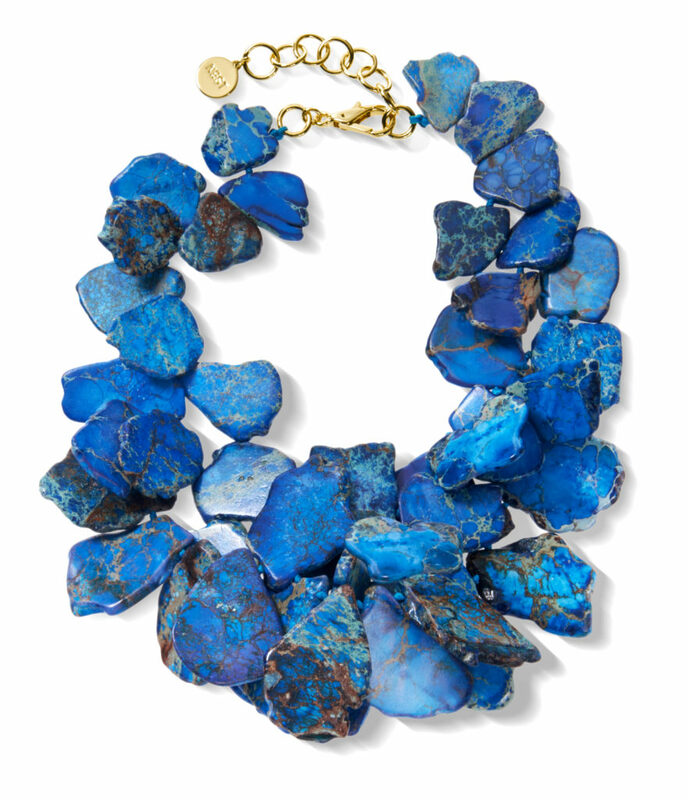 I want you all to take a leap of faith, live on the edge, and buy a statement necklace! For the next week we are offering $50 off of these three necklaces using the coupon code: STATEMENT . As always we love you and thank you for loving your NEST! 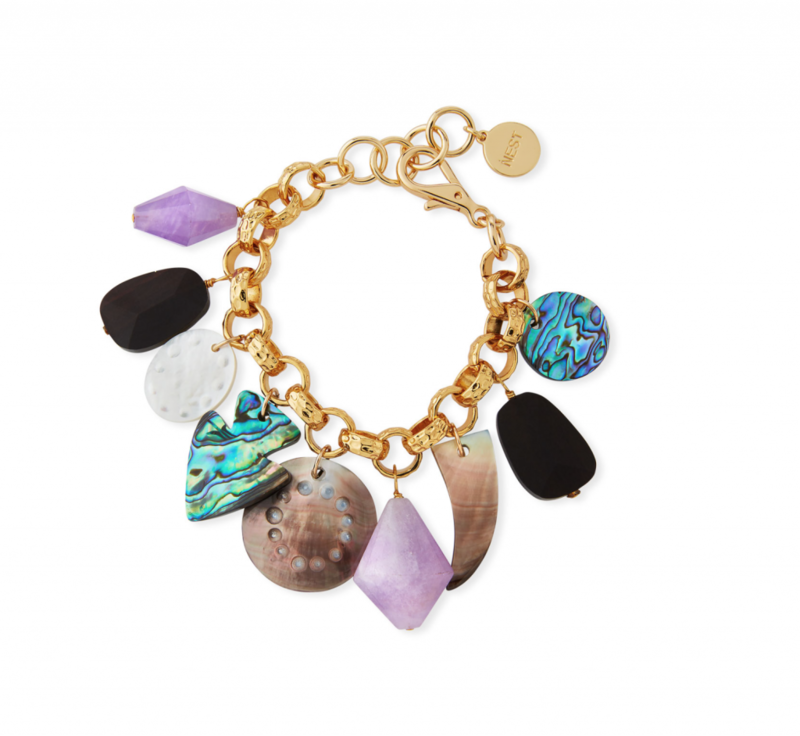 Spring is almost here and that means one thing…short enough sleeves to wear a ton of bracelets!! I LOVE this look! To wear it like a pro make sure to have various widths and materials. 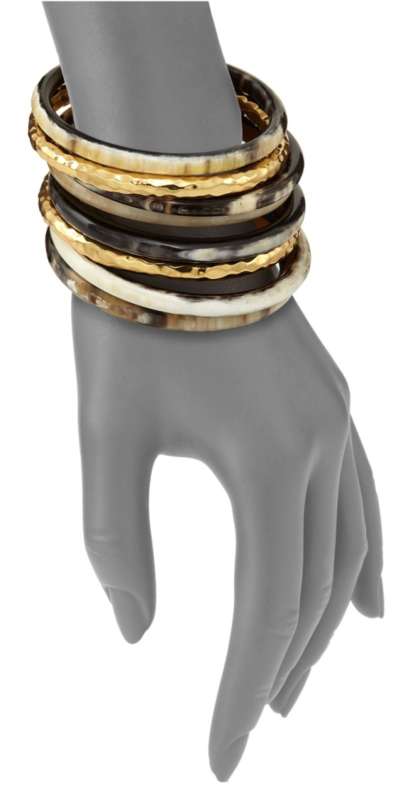 I like it best when worn with two to three widths of our horn bangles then add a skinny metal bangle or even the bi-cone stretch bracelet. You can also keep it interesting by keeping all the materials the same but having a variety of shapes and sizes. The monochromatic look is very chic and super easy to wear. Want to take the guesswork out? Great! We have put together a couple of stacks for you. 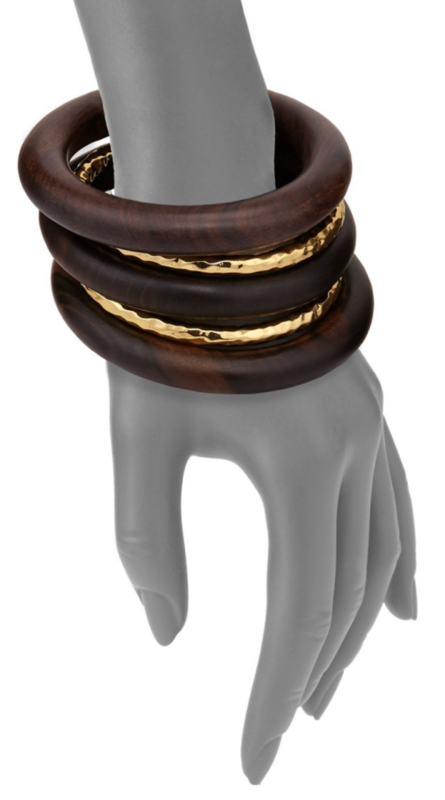 Our Ebony Wood Bangles and our famous Mixed Horn Bangles mix well with almost any look and are great starter sets. They’re also the best bang for your buck because you can wear the bracelets as individuals, put on a few, or rock the whole thing! 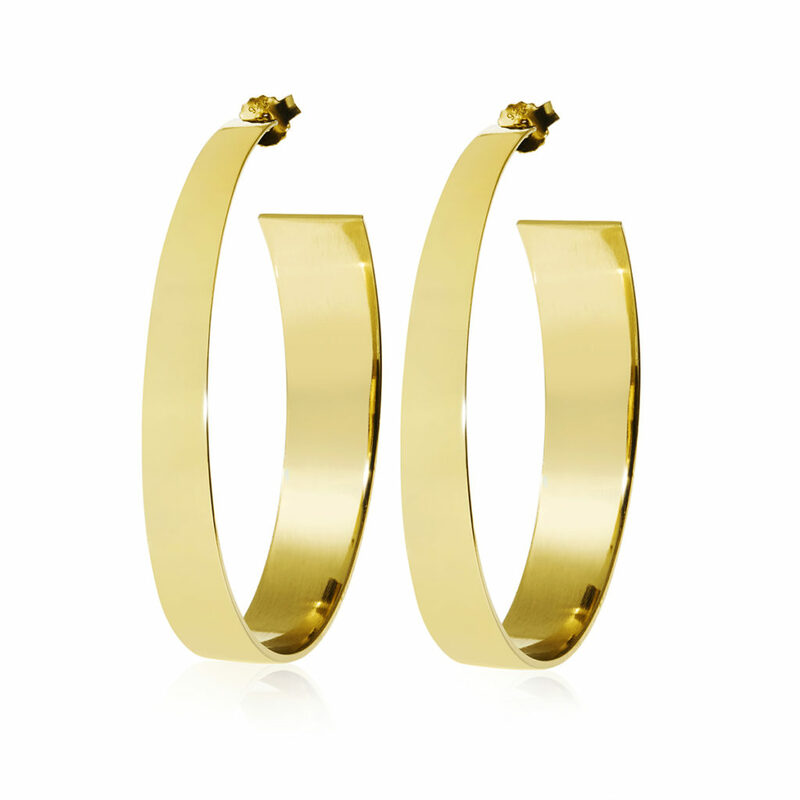 If you want to jazz these up even more you can add a wide bangle. Just have fun with these! You can’t go wrong. 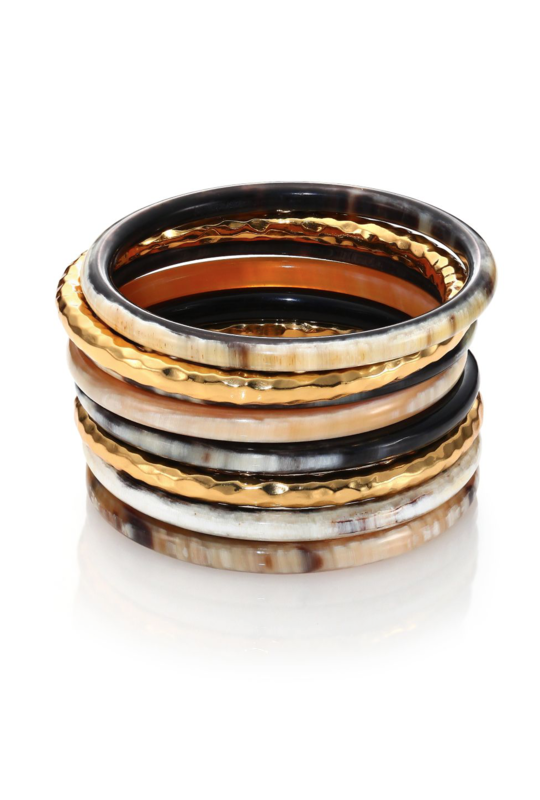 Maybe you already own some of our Skinny Bangle Sets that are essentials to any NEST collector. 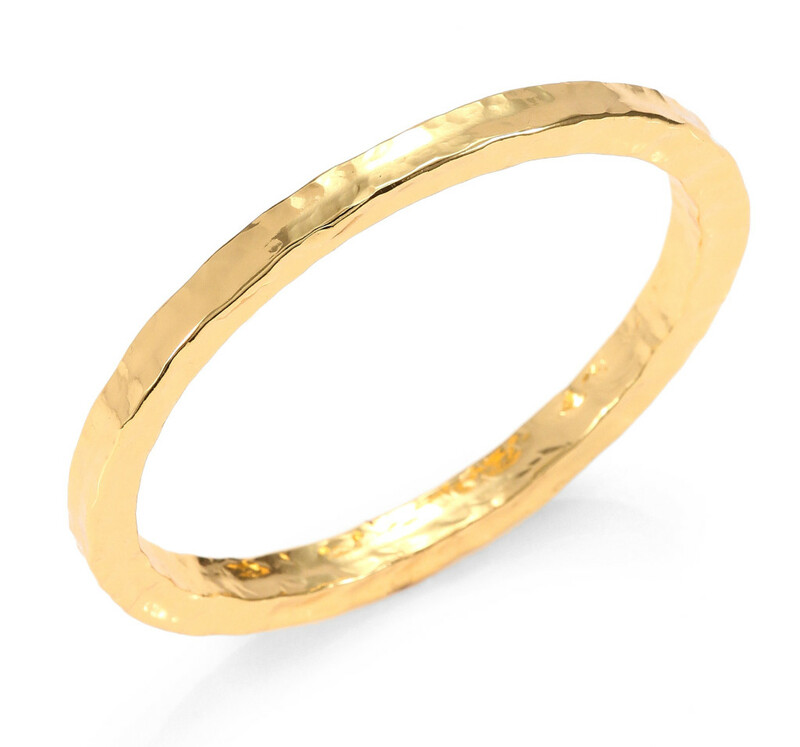 No need to get an entirely new stack, just add one or two Hammered Bangles in either gold or silver. 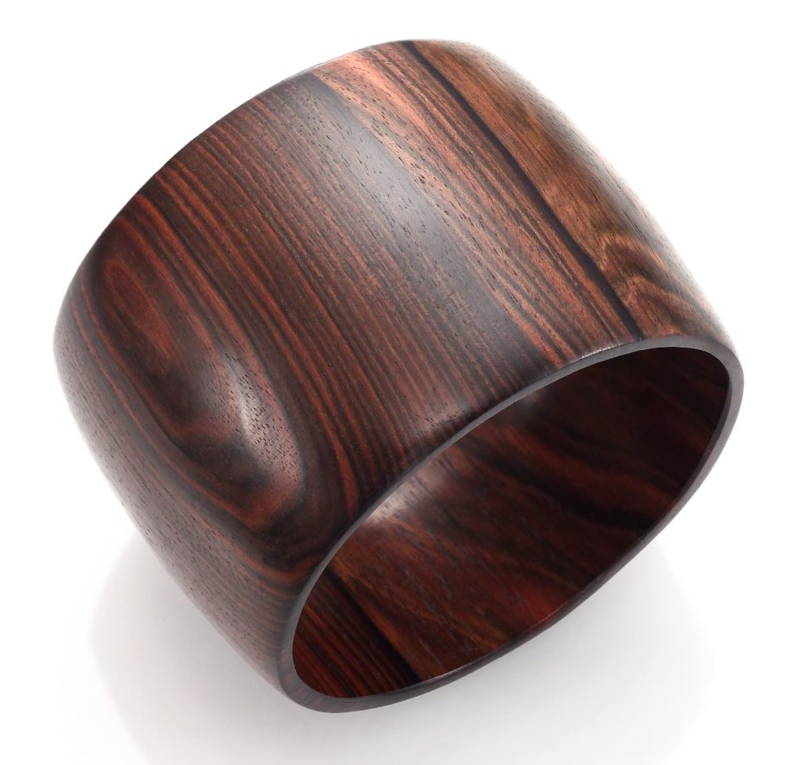 Whatever the mood is for the day, NEST has a bangle to fit it! Now it’s time to get shopping! Enjoy 10% off anything on our site from now through April 30 by using the code: STACK. THANK YOU for being NEST collectors. We love you! 1. Make sure you LOVE it. We’ve all been there; we like a piece and we think we can make it work so we take it home and then it sits in the box or tucked away in our closet until we get rid of it. Don’t do that! If you love it the day you get it then you will always find yourself picking it up out of the jewelry box first. 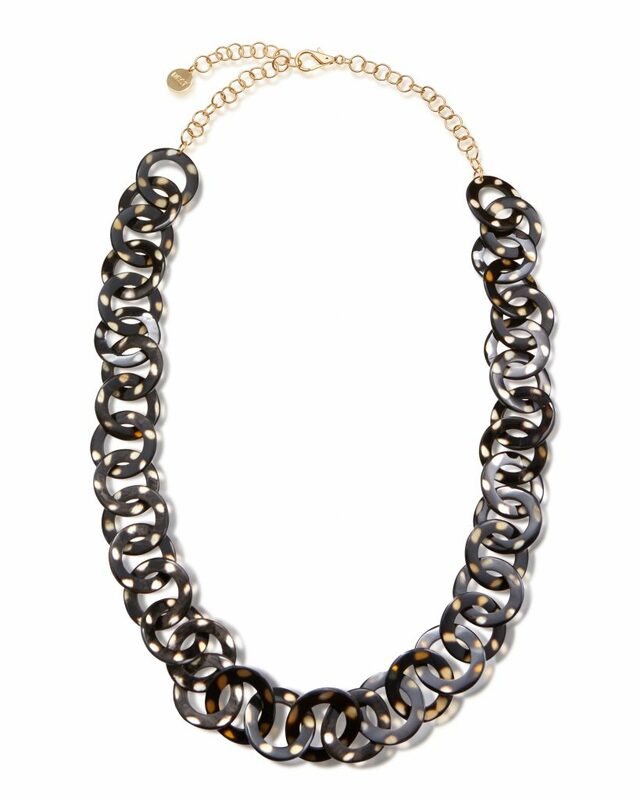 Take our iconic Chunky Necklace for example. 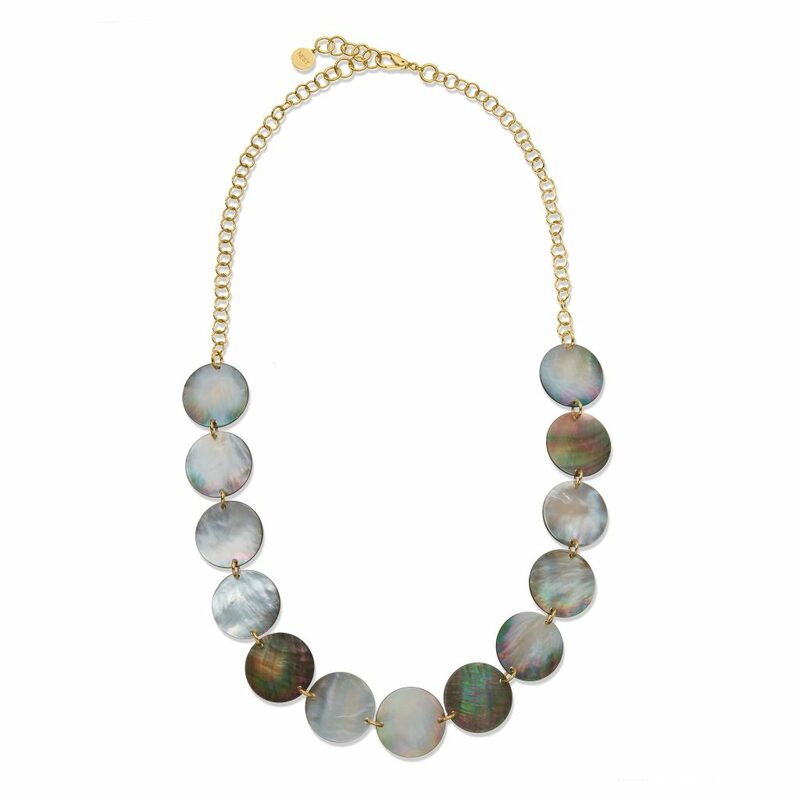 We have made this necklace in every color imaginable for what seems like an eternity. You might think I would be over it but I still wear mine ALL THE TIME. It’s easy, eye-catching and definitely unique. To keep things interesting I suggest not always buying matching sets. 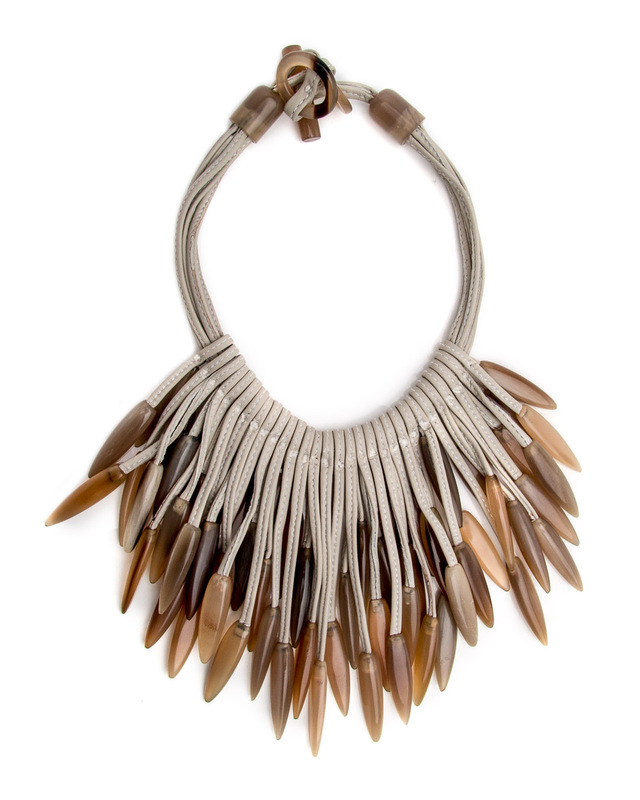 I would pair our new Leather Horn Drop Statement Necklace that has a raw, tribal look with our simple Brushed Gold Bi-cone Stud Earrings. 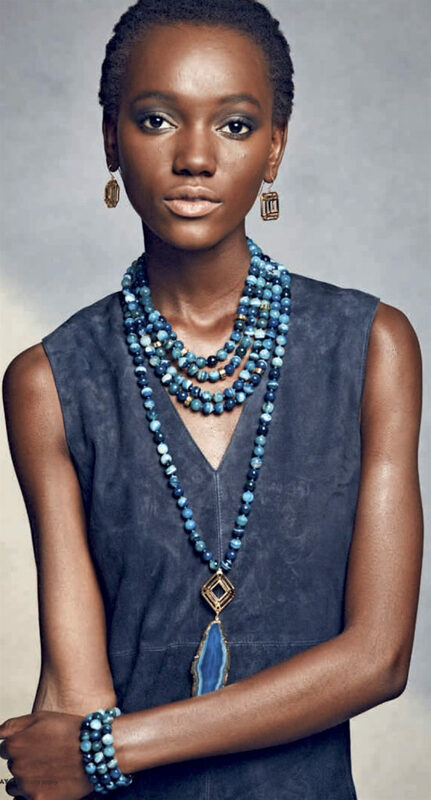 I like that the earrings don’t take away from the dramatic necklace. 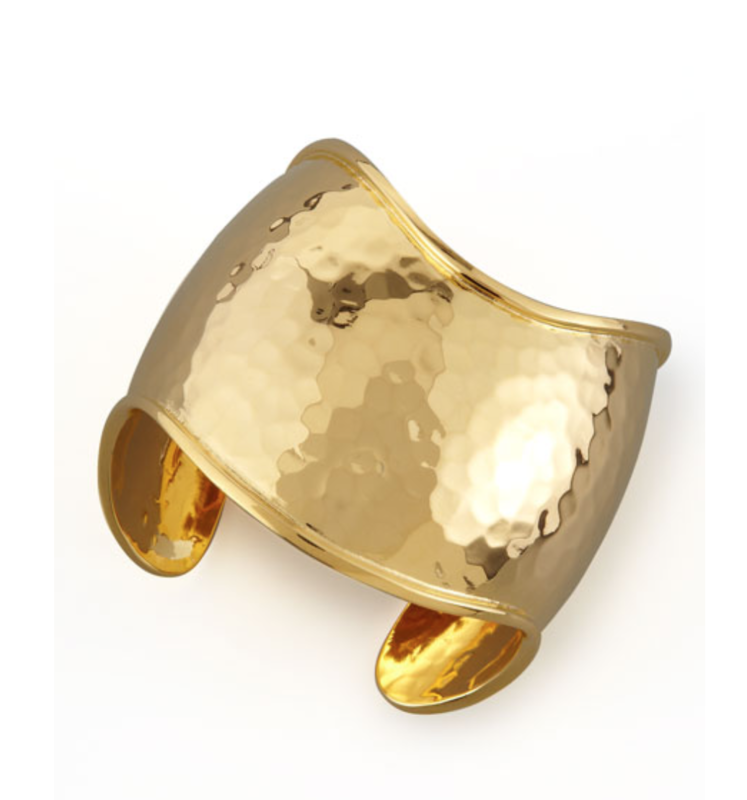 Although, if you want to dress this up then I would add our Horn Disc Cuff with the shiny gold, sleek edges. 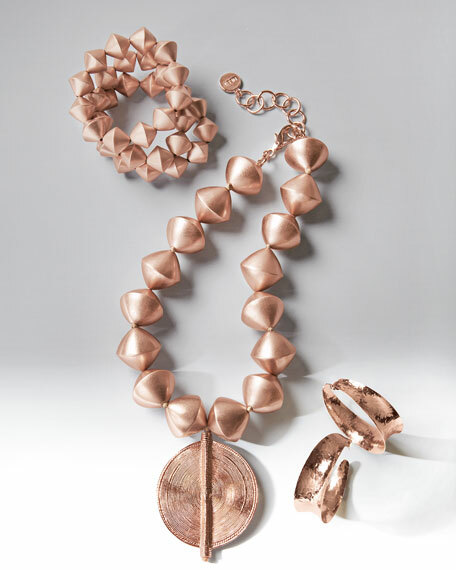 Don’t be afraid to mix metals! 3. Stock up on essentials. The best way to keep your collection working from season to season is to have good basics that you can wear with anything. These are my top picks. I also call these my “travel pieces” because I can pack light and still have everything I need from day to night. After you build your essentials and mix and match like a pro, then it’s time to get a piece that will turn heads. My pick for this season is our Red Coral and Horn Link Necklace. We want you to have a blast stocking up! Now through March 15, enjoy 20% off your entire purchase using the code: SPRING. Can’t wait to see your collections!